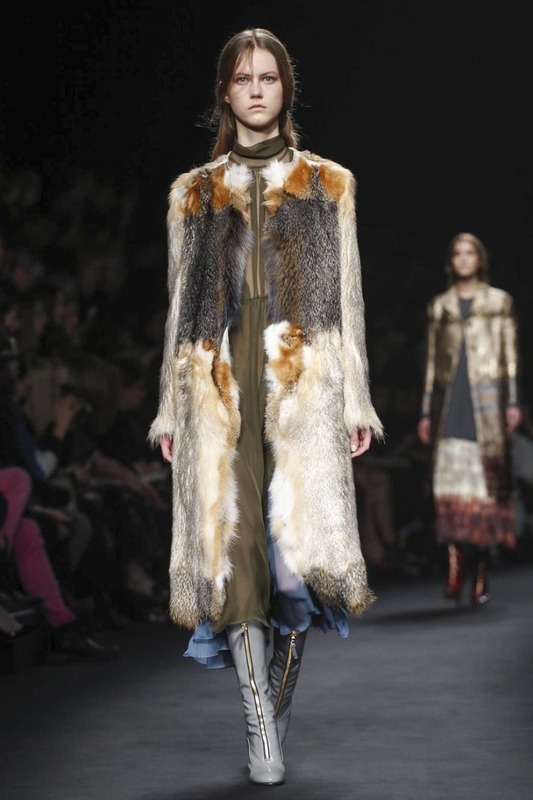 Back to collections for fall&winter seasons. 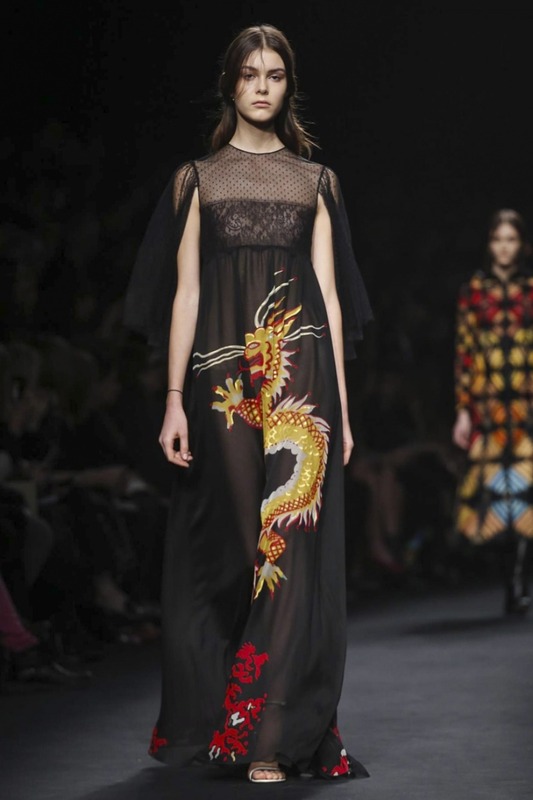 Paris Fashion Week, March 10 ,2015. 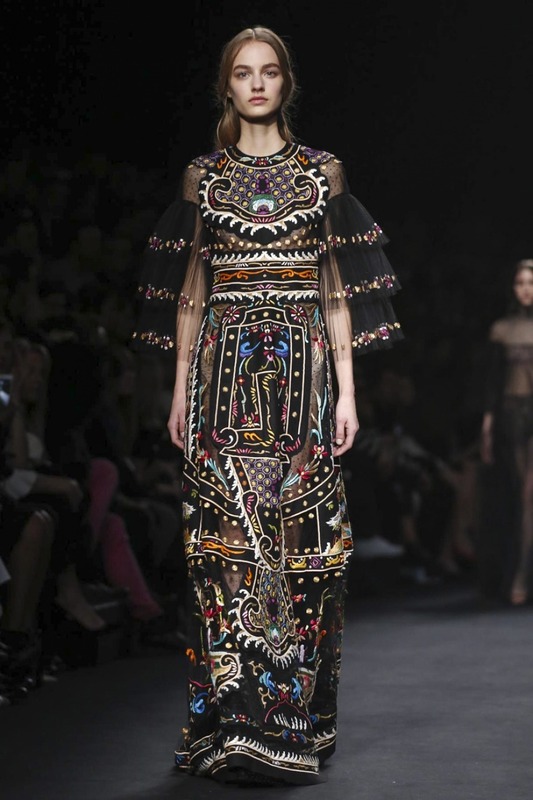 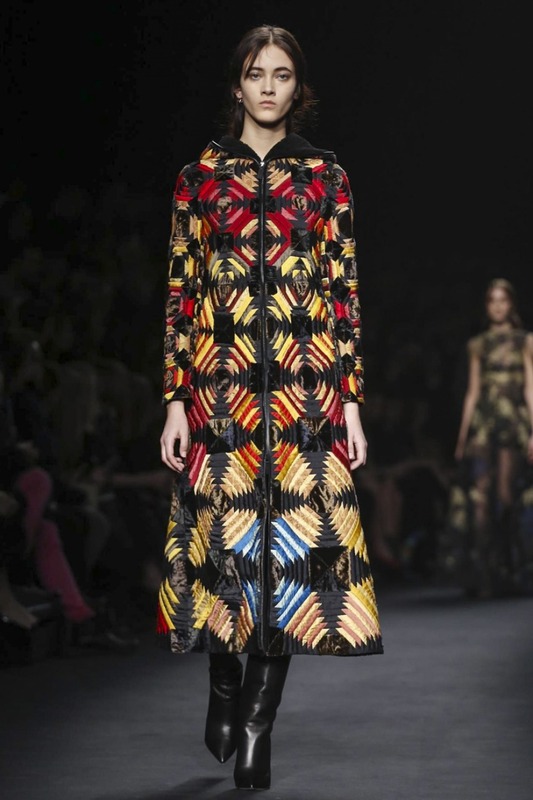 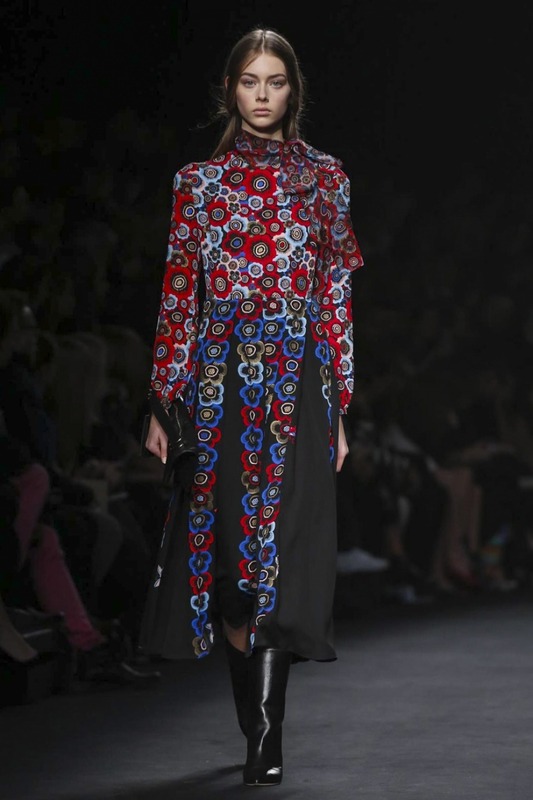 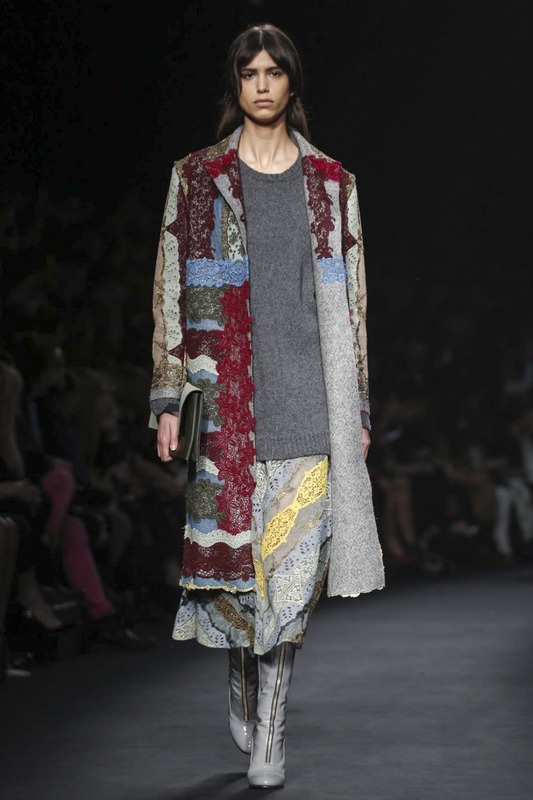 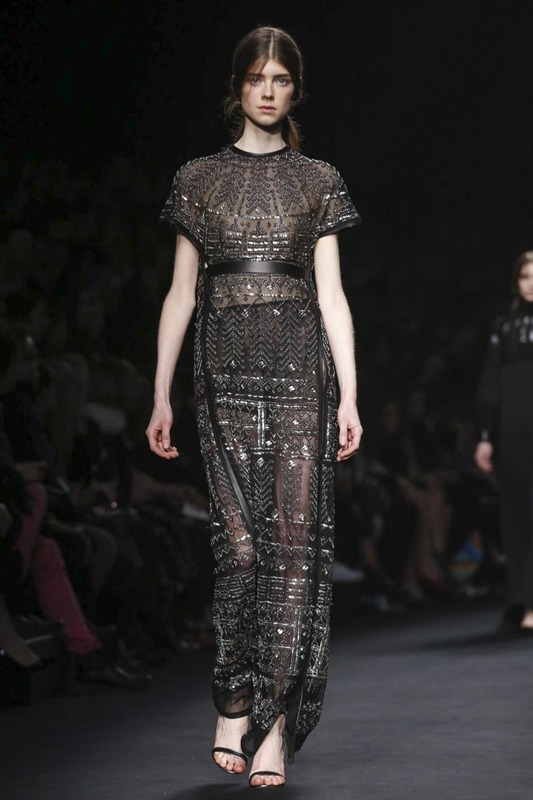 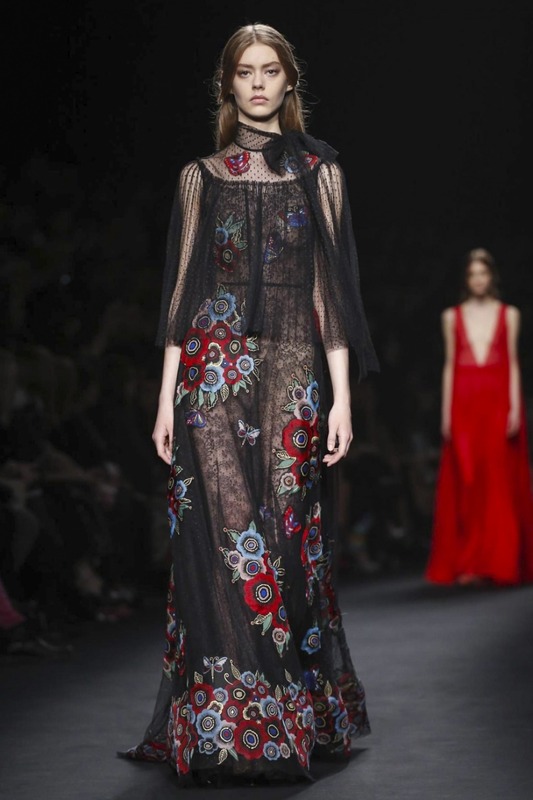 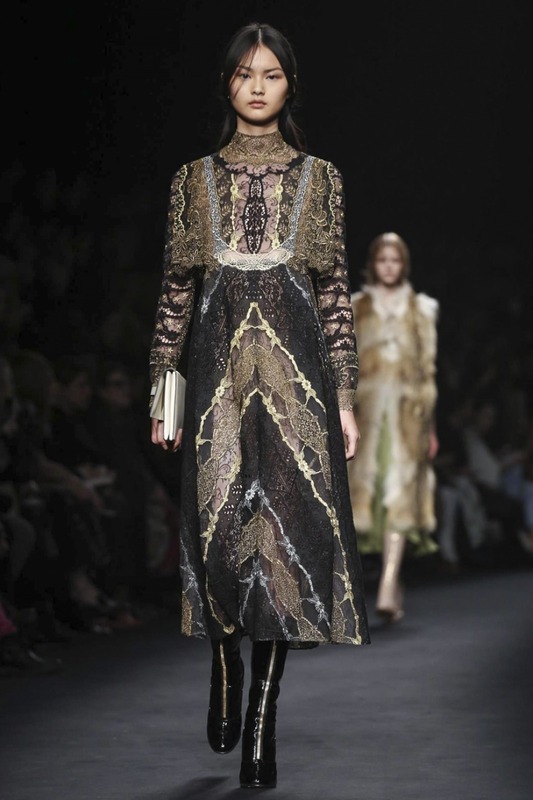 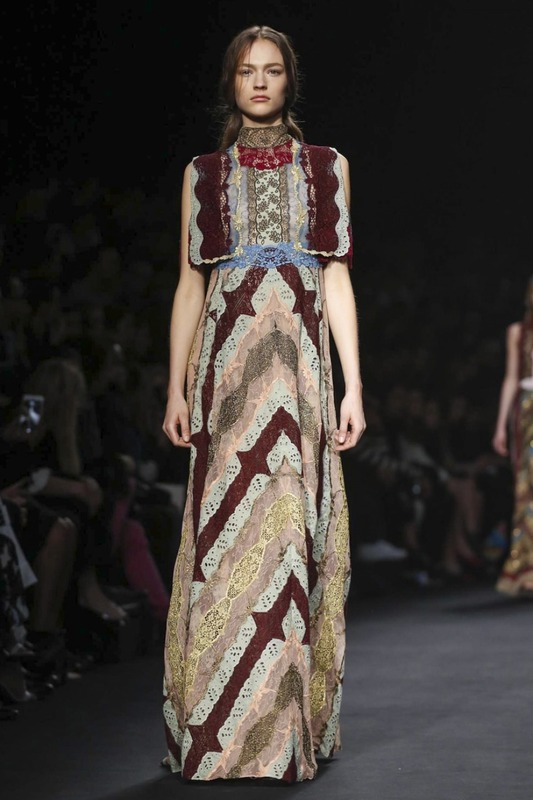 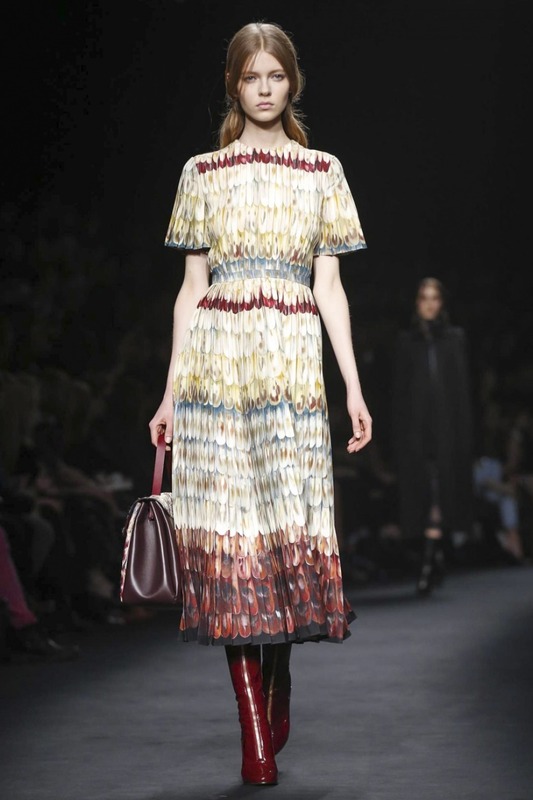 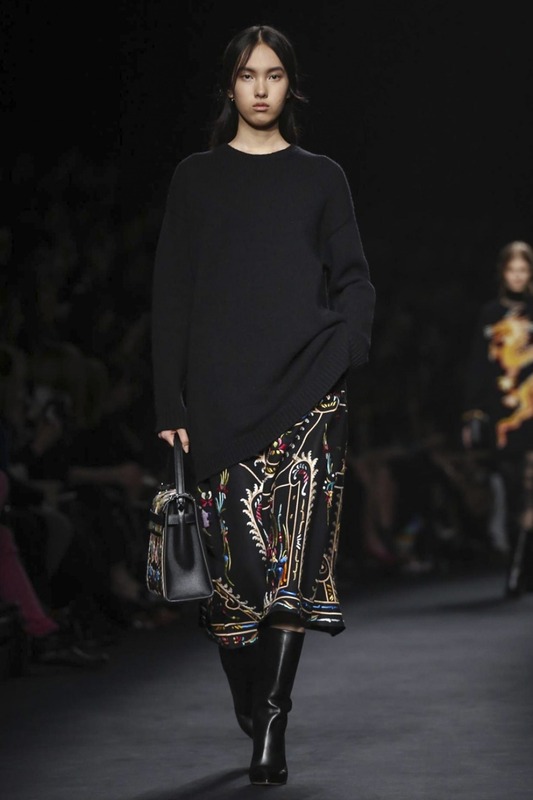 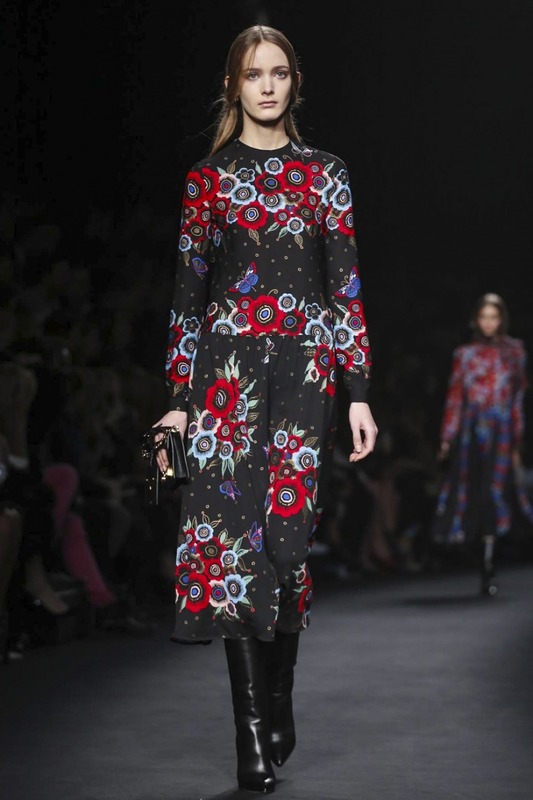 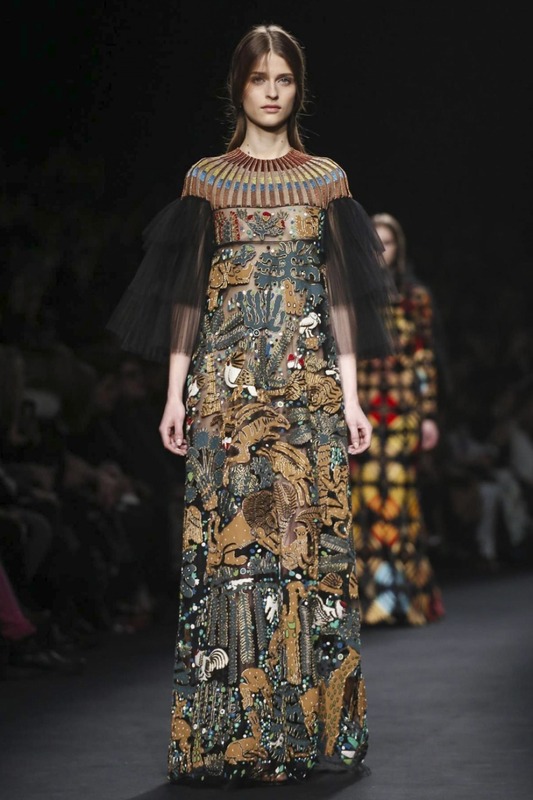 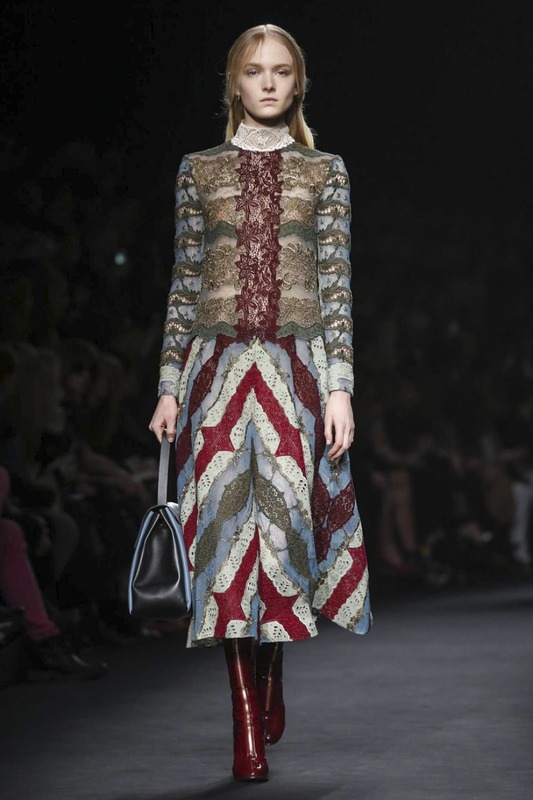 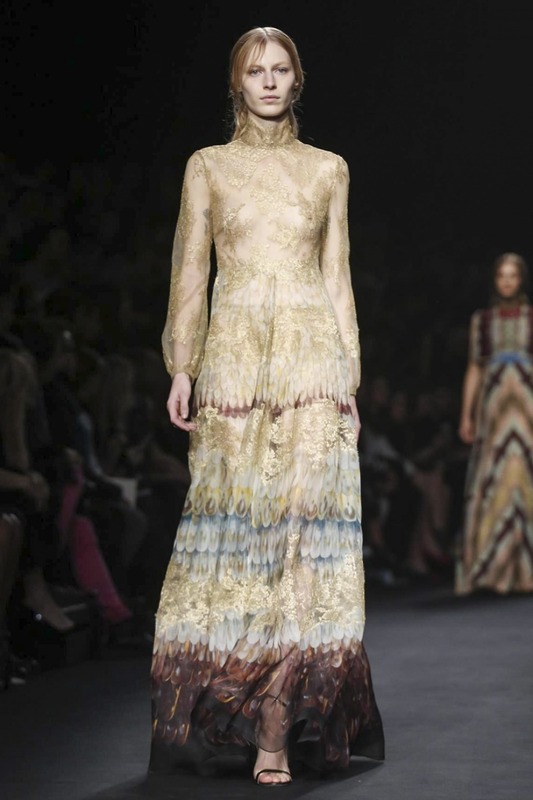 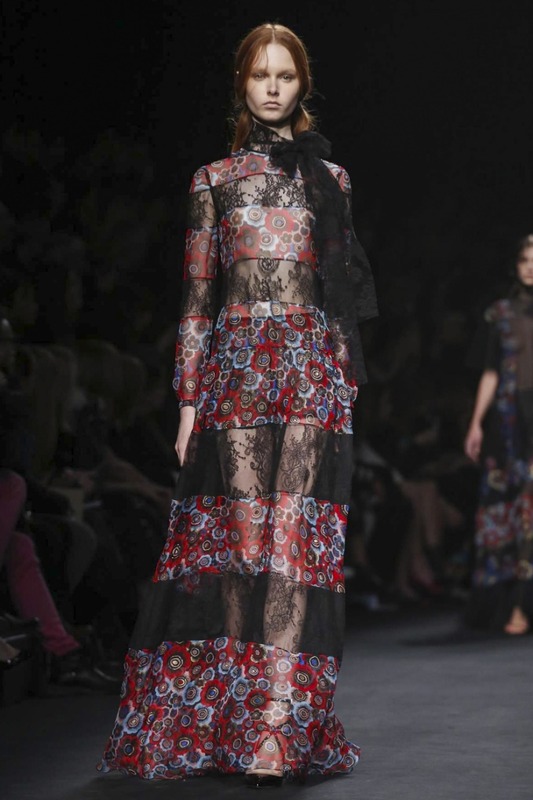 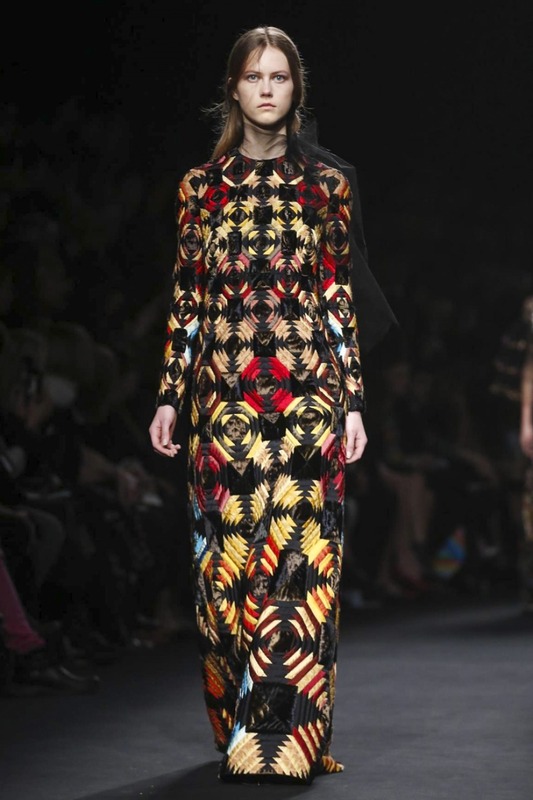 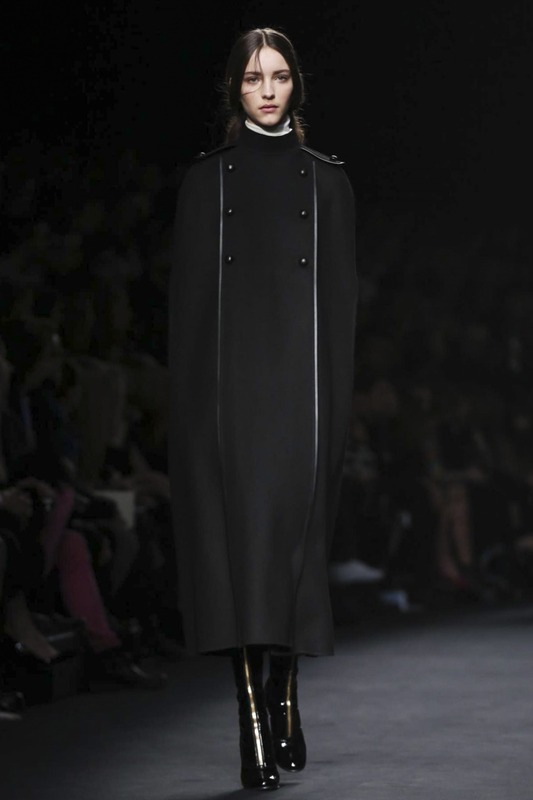 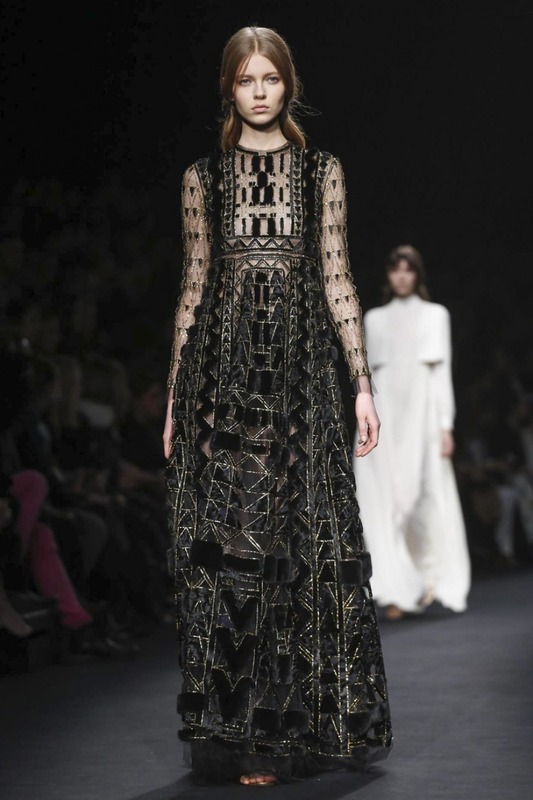 Valentino Fall/Winter 2015-2016 pret-a-porter collection designed by Maria Grazia Chiuri and Pierpaolo Piccioli. 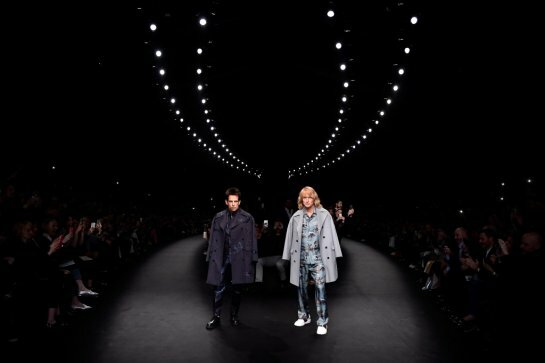 A lot of us will remember this Show about Derek Zoolander and Hansel, aka Ben Stiller and Owen Wilson,the both came at the tail end of the Valentino Show ,do you remember it? 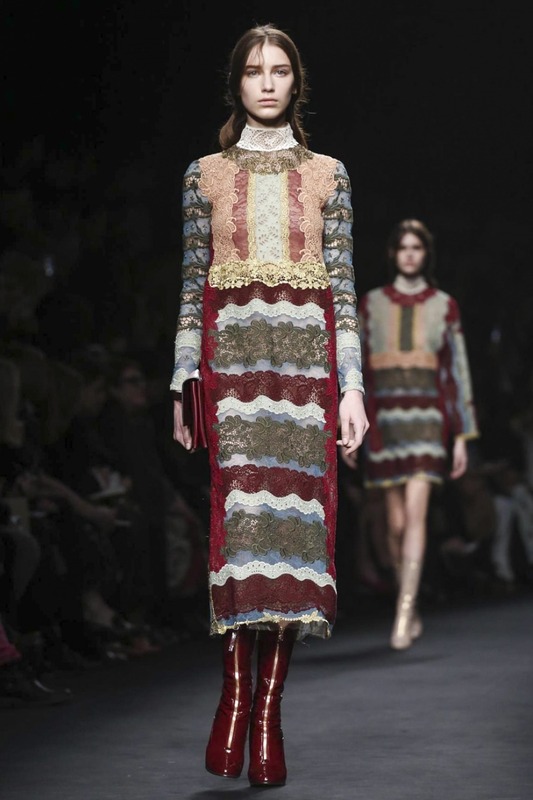 Chiuri and Piccioli go to their Italian origins for inspiration. 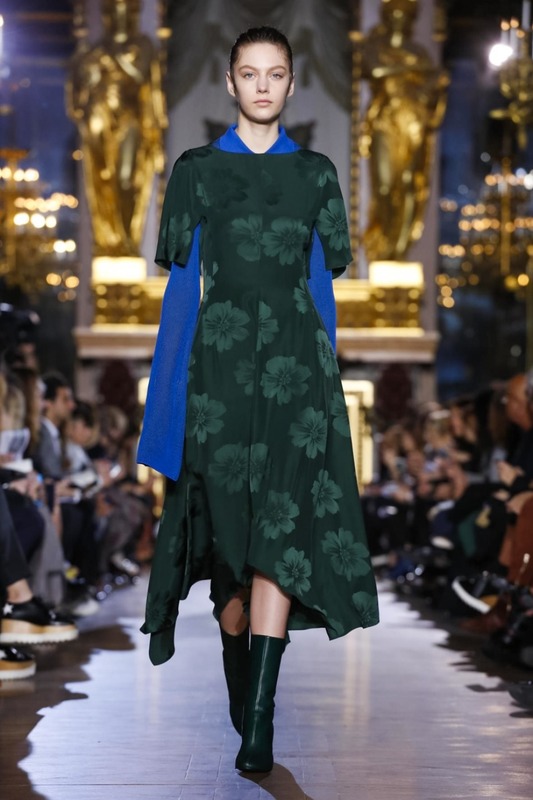 For Fall they looked at Emilie Flöge and Celia Birtwell, two women who were both artists and muses (Flöge to Gustav Klimt, and Birtwell to her husband, the designer Ossie Clark, as well as the painter David Hockney). 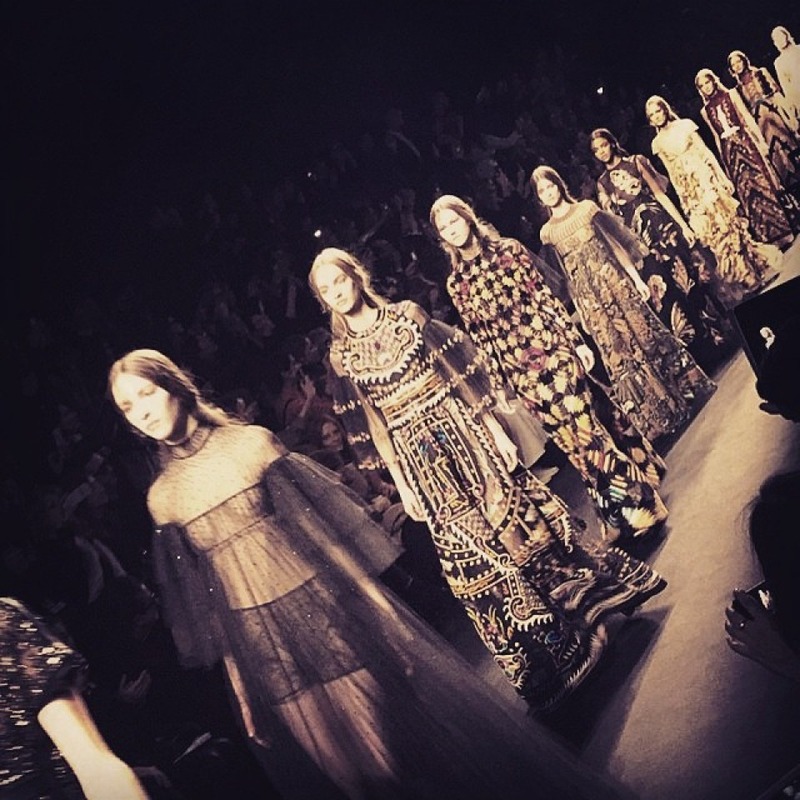 The new perspective energized them. 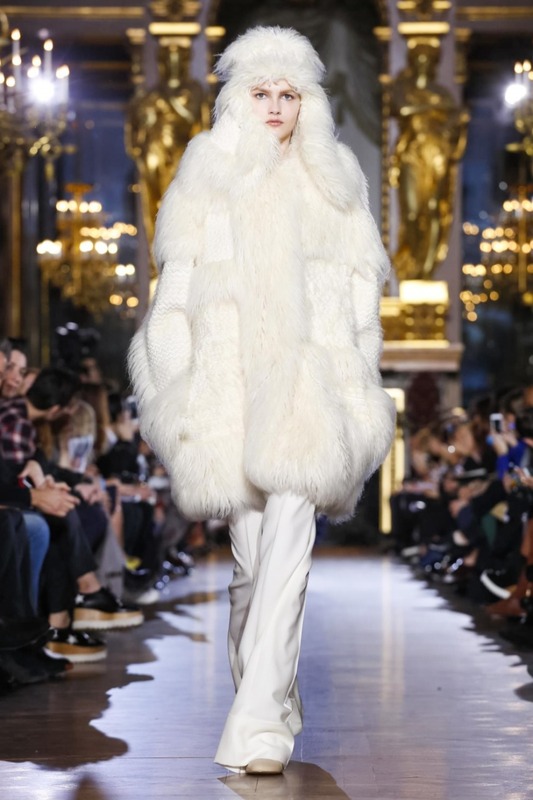 Flöge, who was a couturier in her own right and rejected her era’s de rigueur corsets, gave the designers the collection’s gentle A-line silhouettes and the gold leaf effects on fox-fur coats, as well as lit-from-within quilted velvet coats. 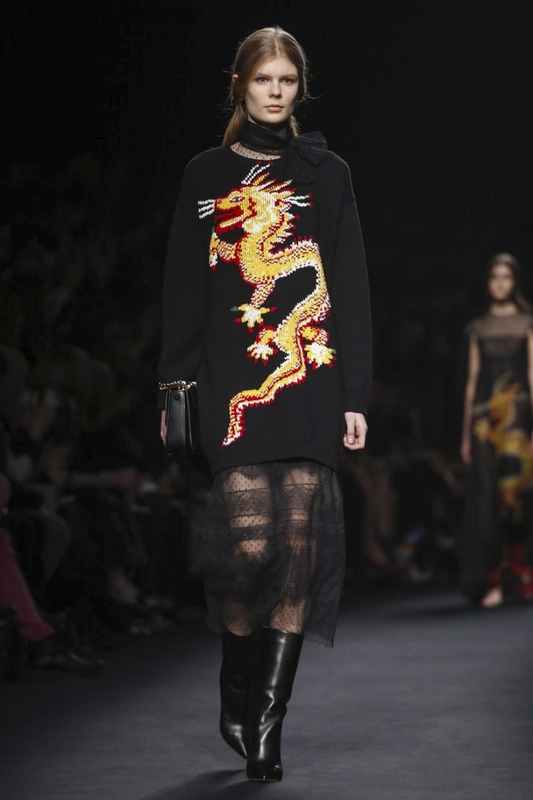 Birtwell, who is still alive and kicking and collaborated with Chiuri and Piccioli on their Pre-Fall collection, supplied the dragon motif that decorated a black trapeze dress. 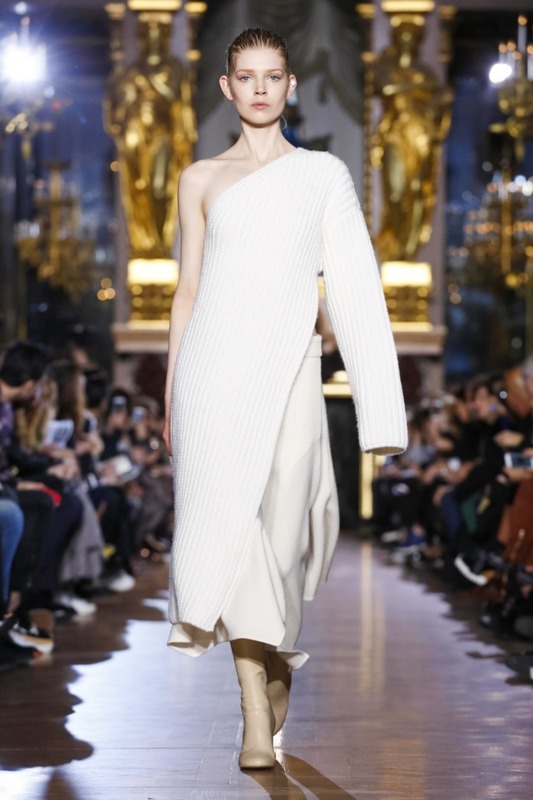 But there was much more at play here, from the casual new vibes of oversize fisherman knit sweaters worn with A-line midi skirts to the sensual efficiency of silk crepe dresses, tie-neck blouse and wide-leg culottes, or an away-from-the-body black dress paneled in tonal strips of leather, as they are at their lovely eveningwear. 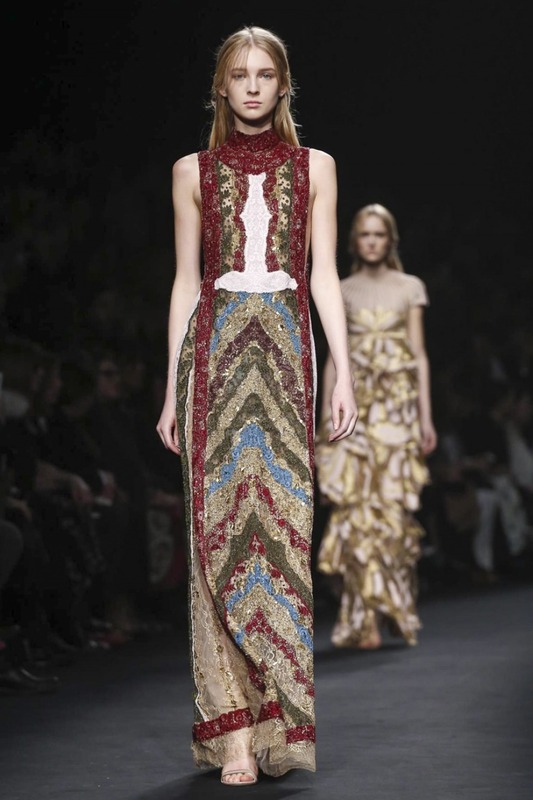 Inevitably, though, it’s the gowns that get the attention. 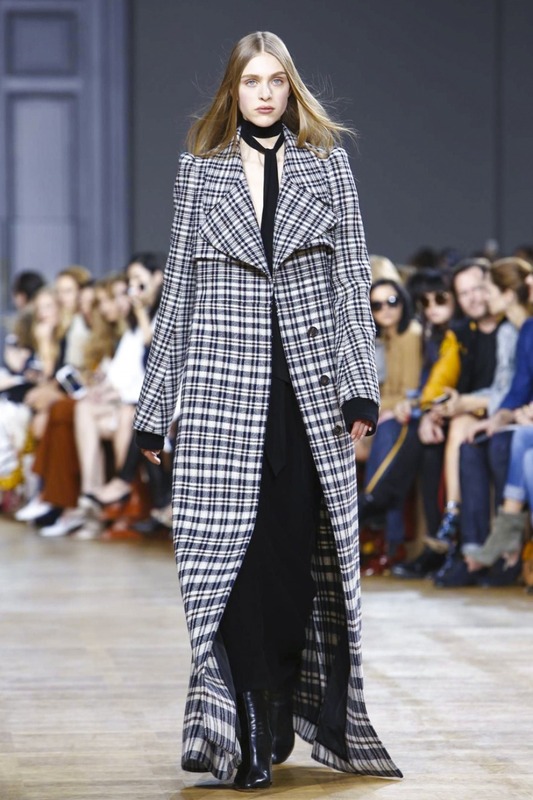 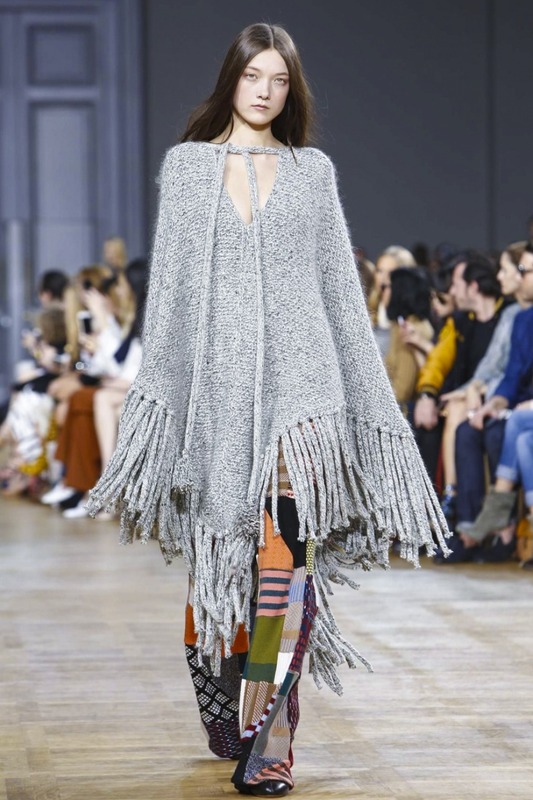 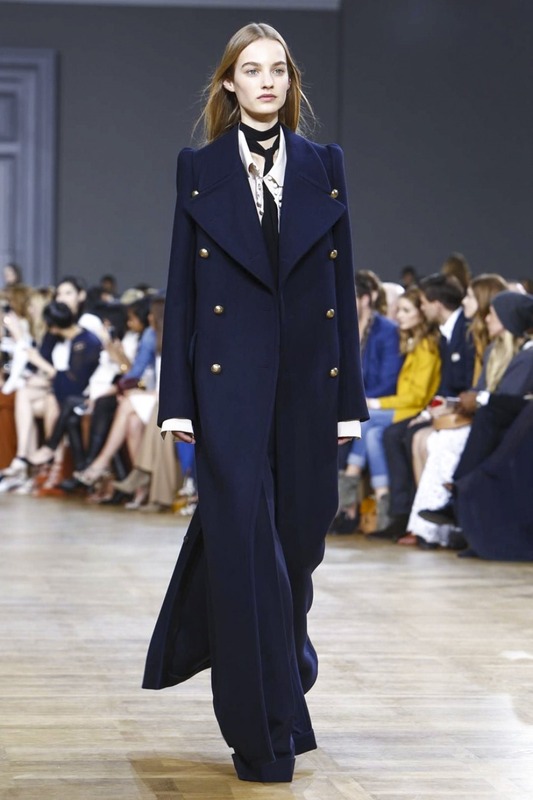 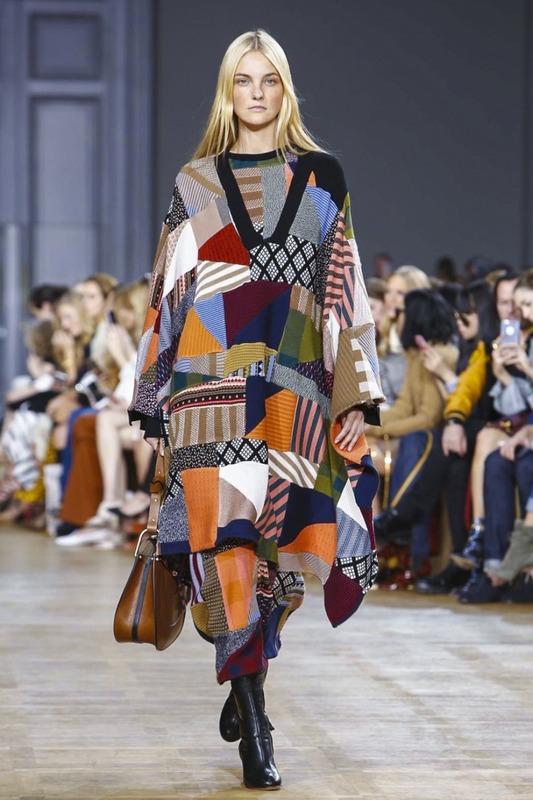 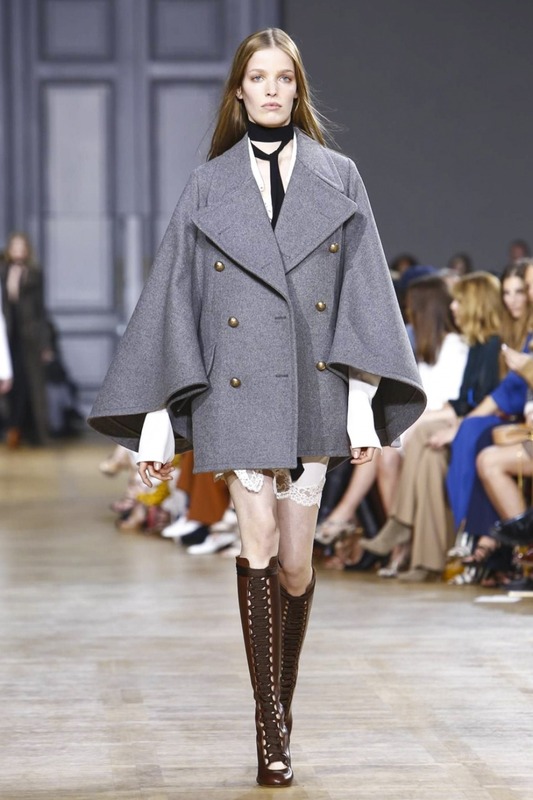 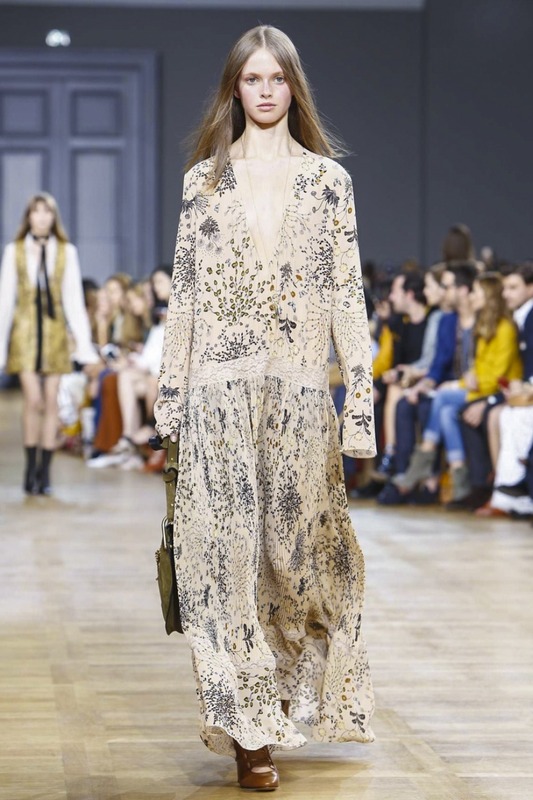 Re-Sees : Chloé Fall/Winter 2015-2016 collection – Chic and sophisticated runway Looks! 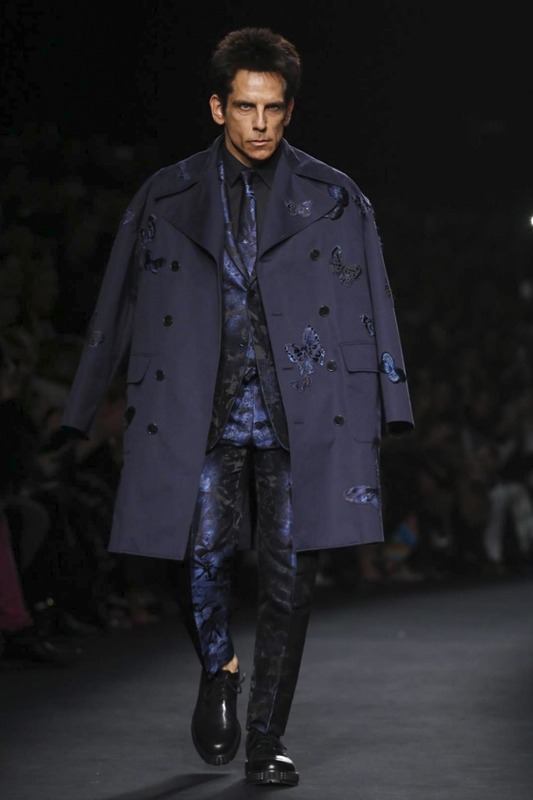 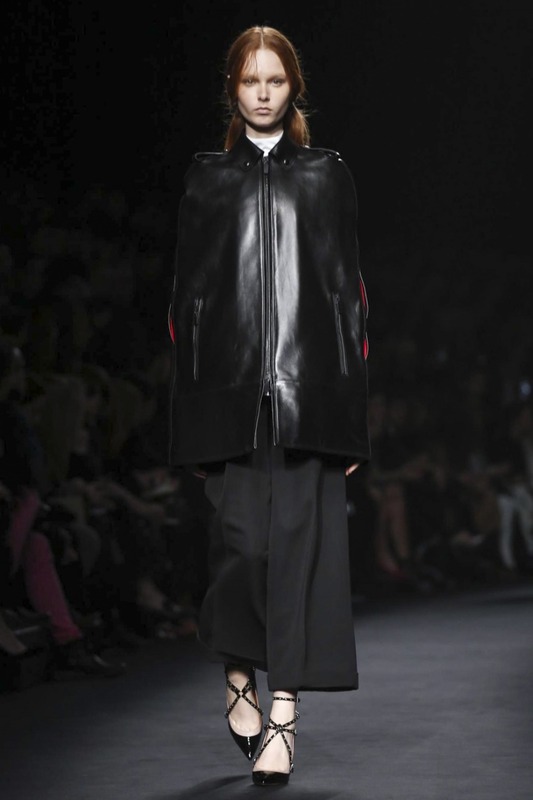 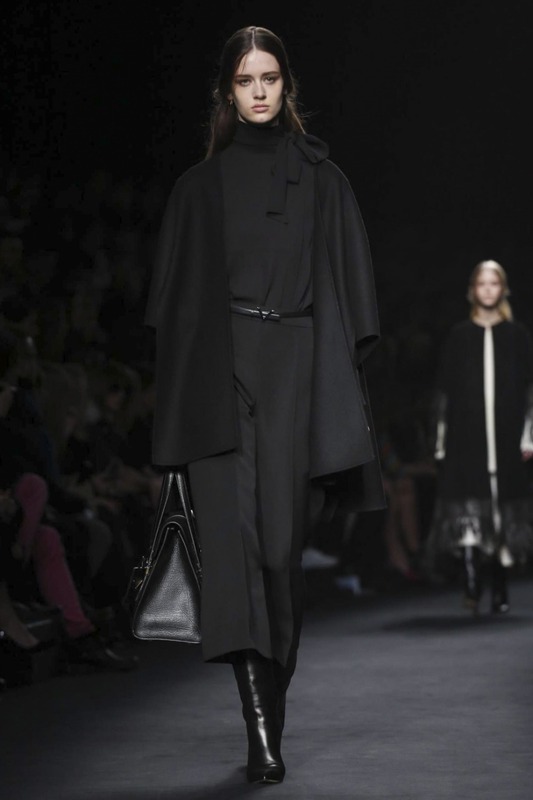 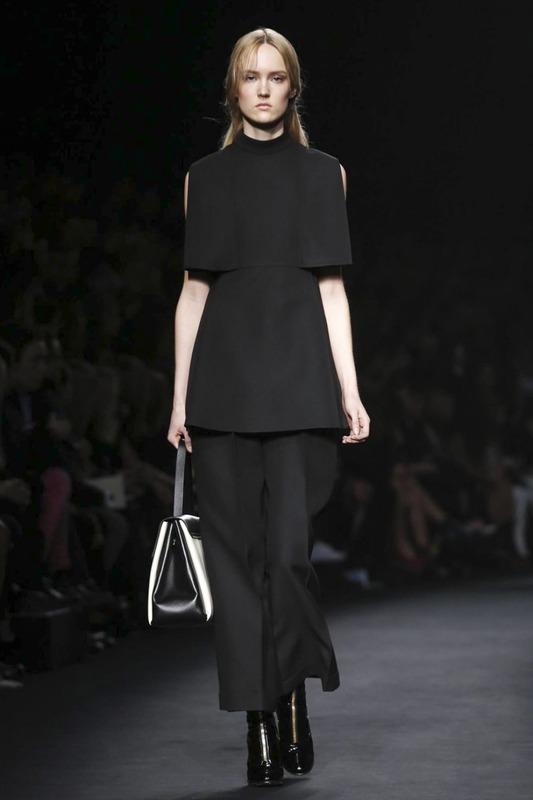 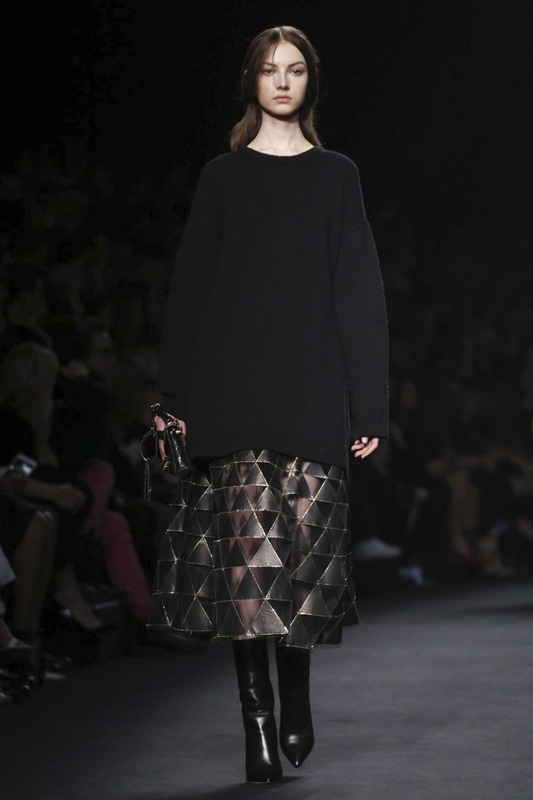 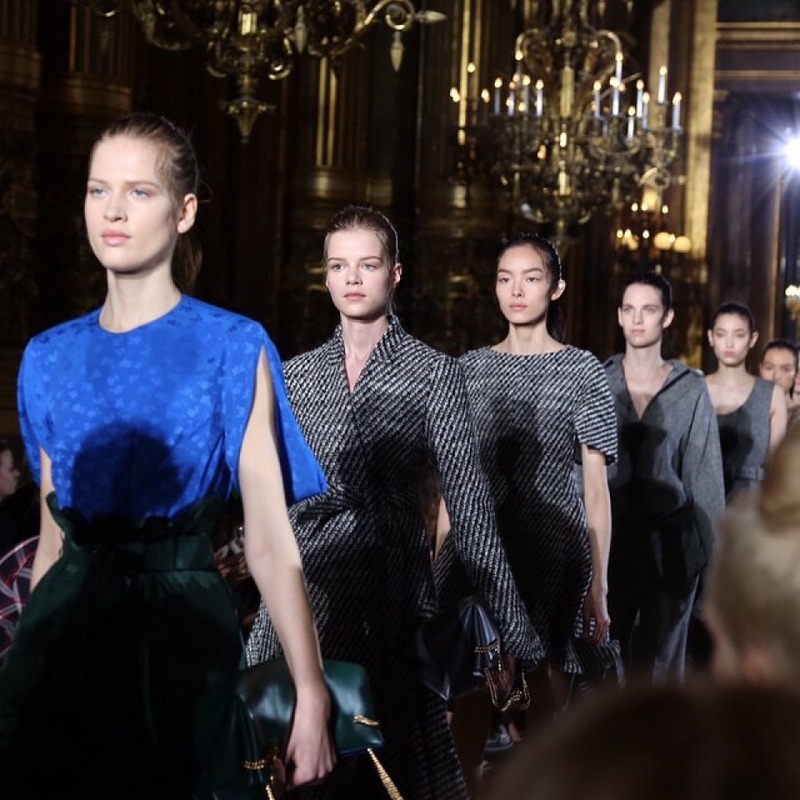 Back to Paris Fashion Week and to collections for fall & winter 2015-2016 seasons. 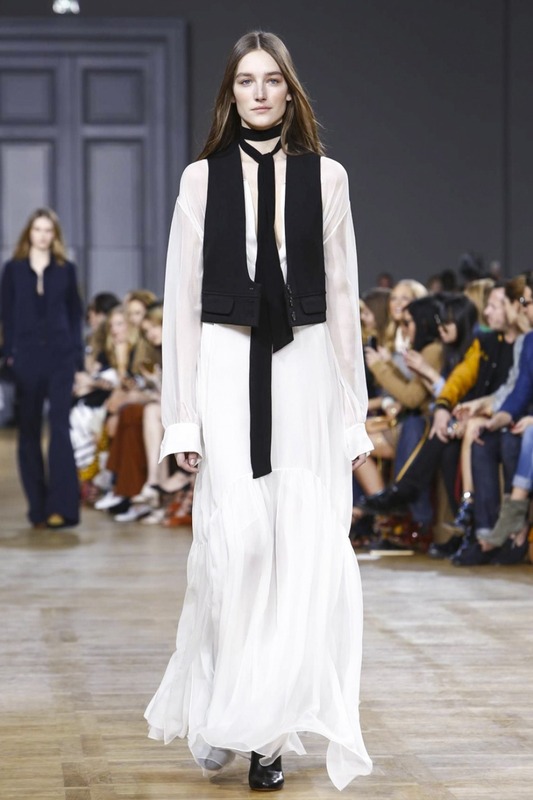 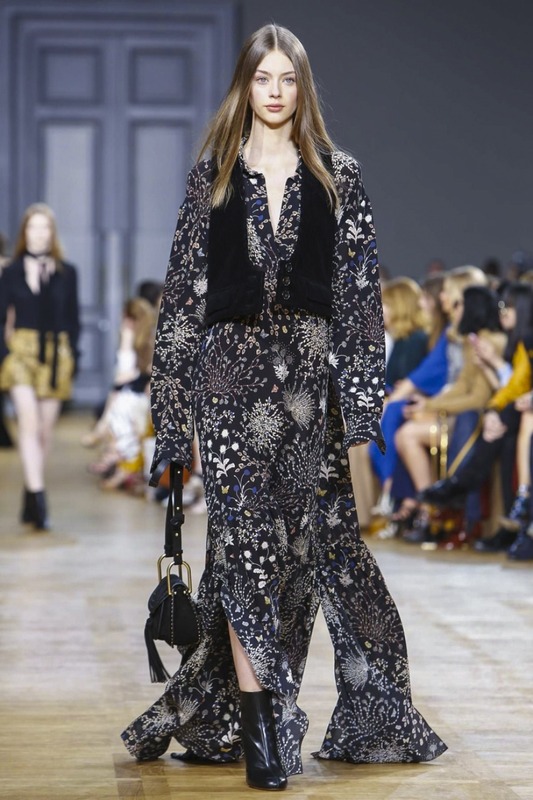 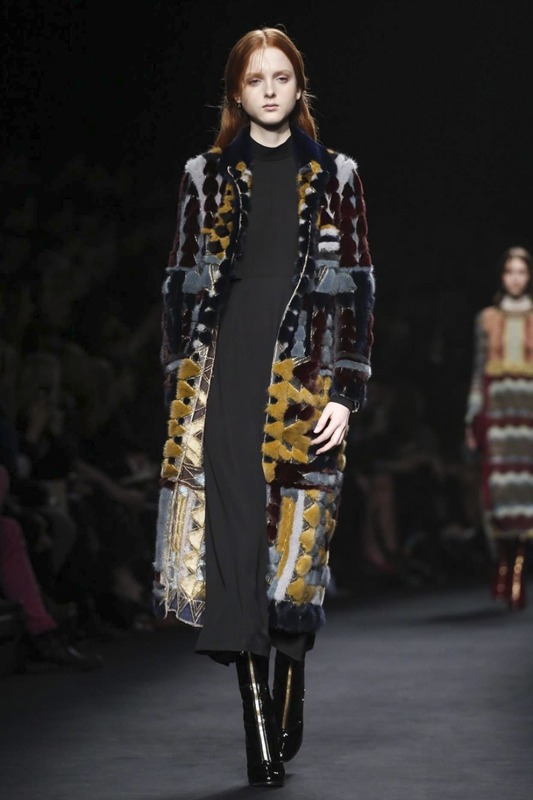 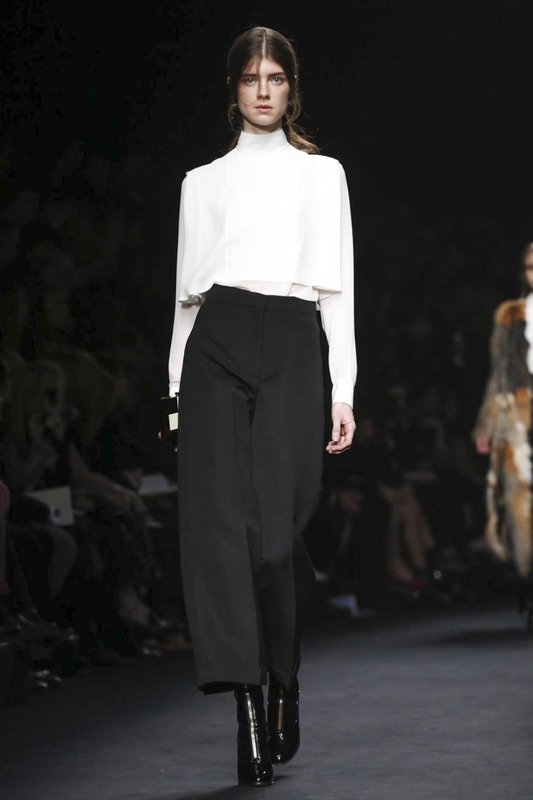 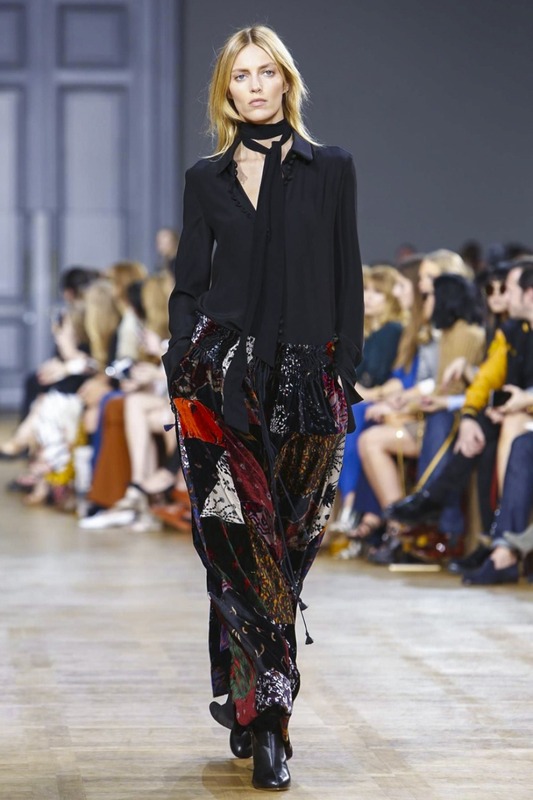 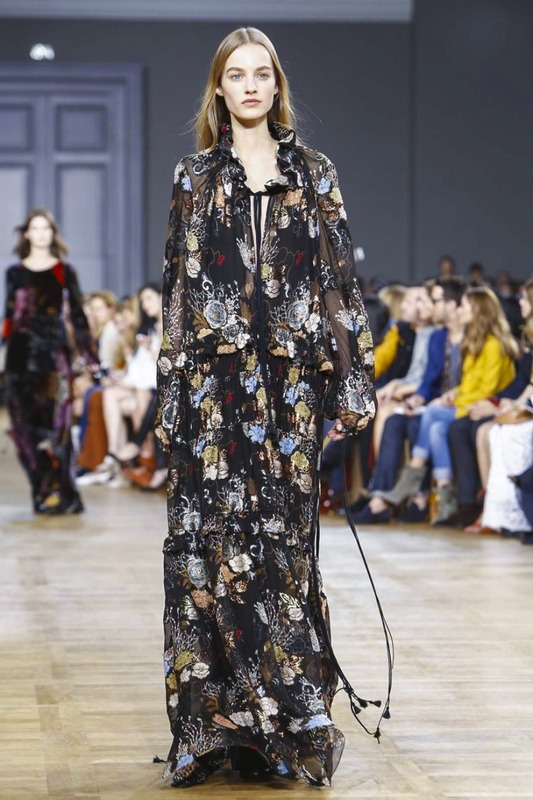 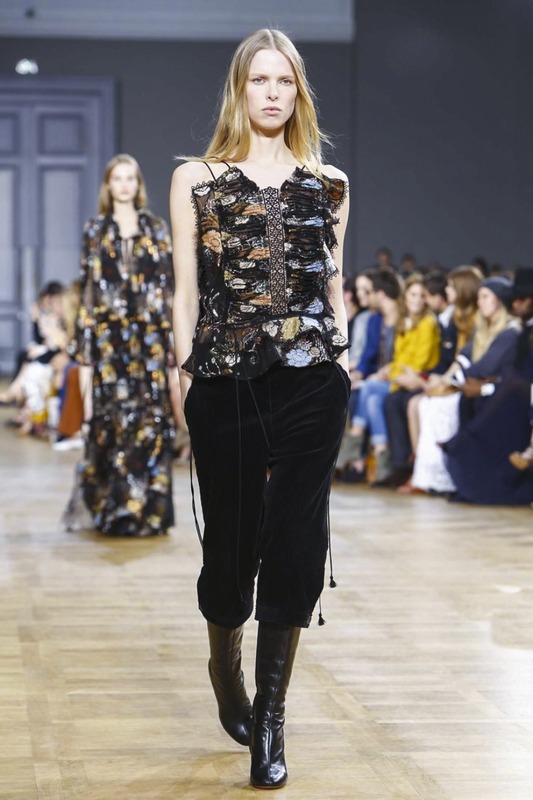 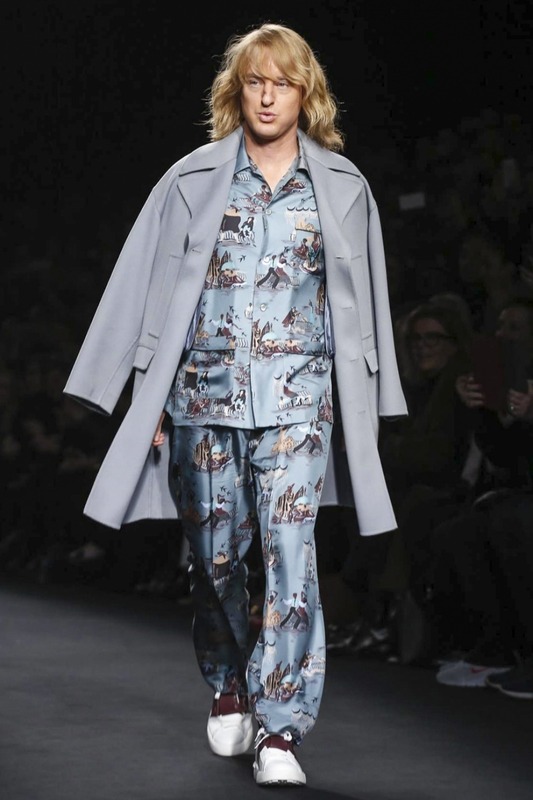 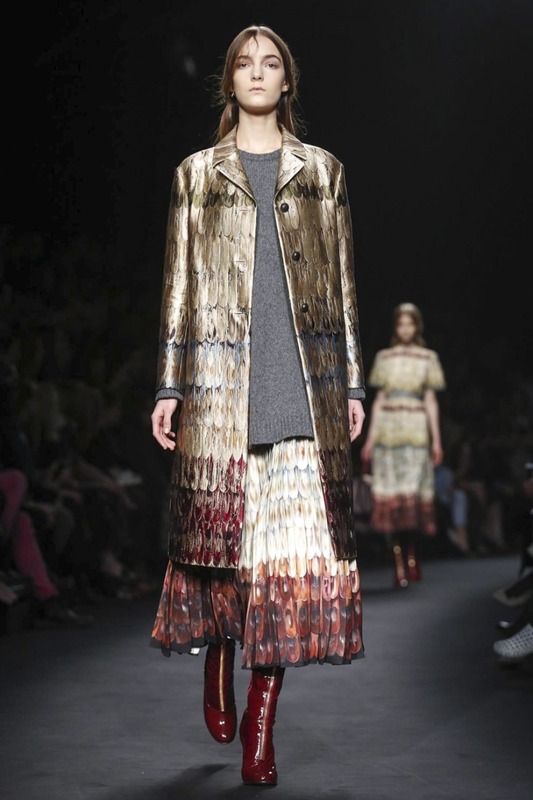 Chloé Fall/Winter 2015-2016 pret-a-porter collection designed by Stevie Nicks was shown on March,8, 2015 in PFW. 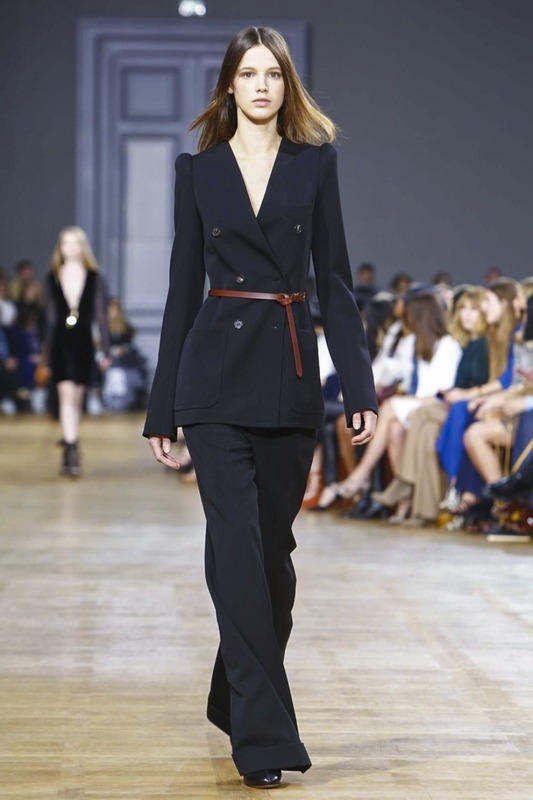 I can only repeat what the collegues wrote yet : “ This is Chloe’s season. 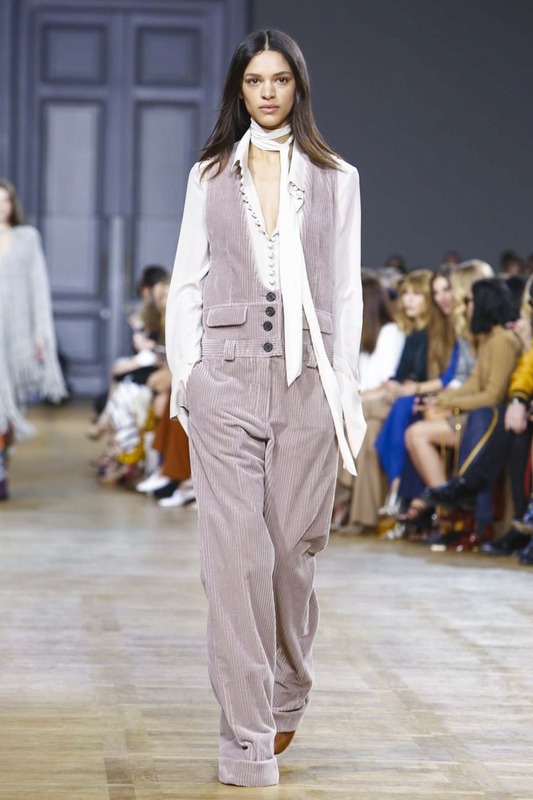 The obsession with the seventies; floor length coats, preferably with some shearling on the side, boho dresses with tall boots and peasant blouses“ . 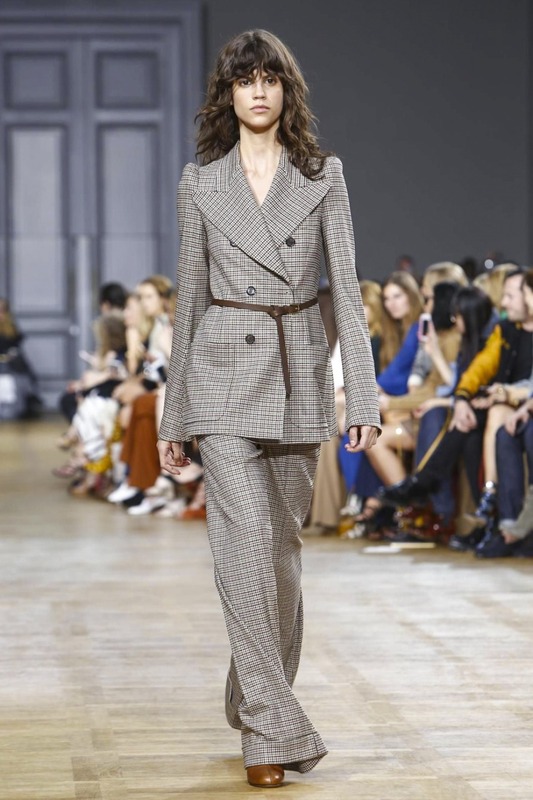 Back to collection, nice, wearble, very 70 ies but in this season it’s IN, and don’t forget, it’s not a vintage, it maybe in vintage style but it’s for woman which lives today, which wants to look chic in fall&winter 2015-2016! 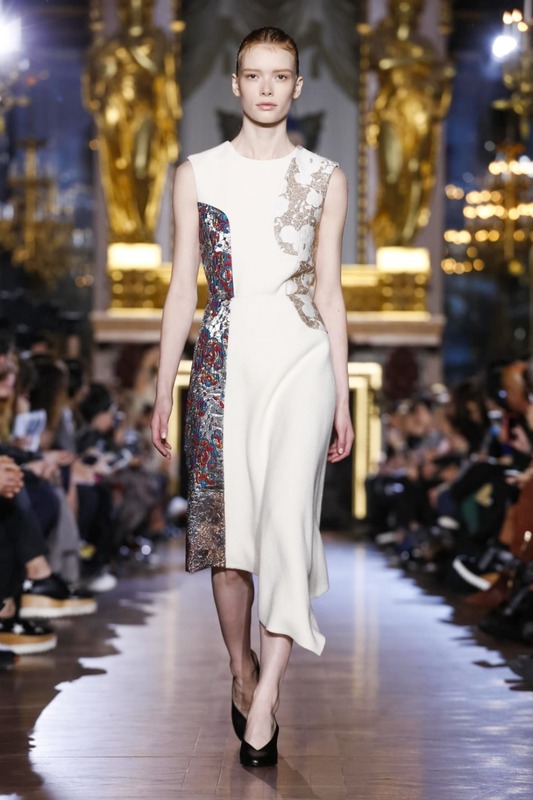 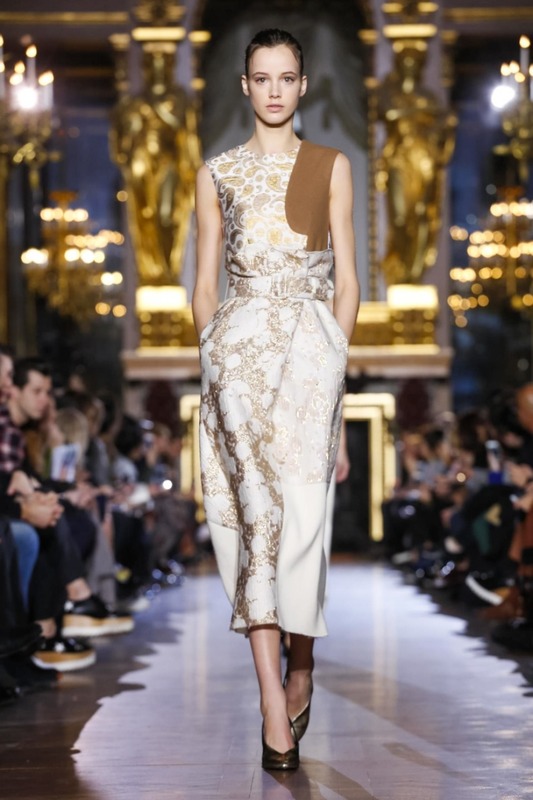 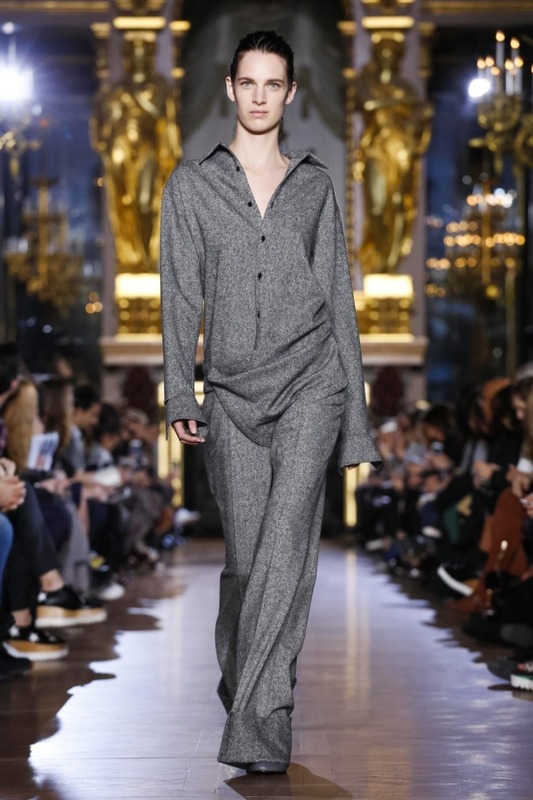 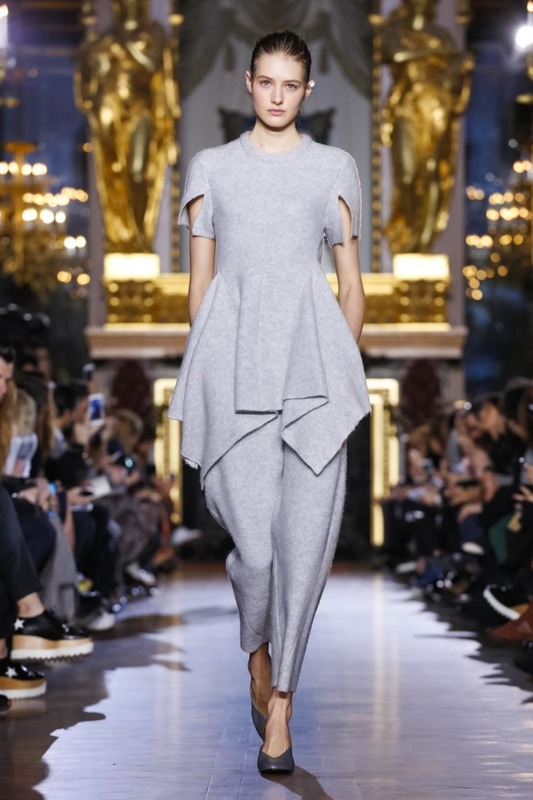 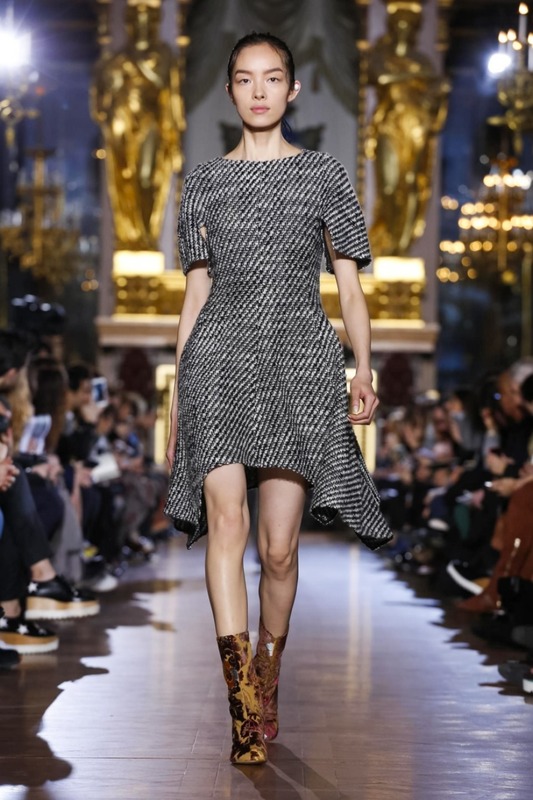 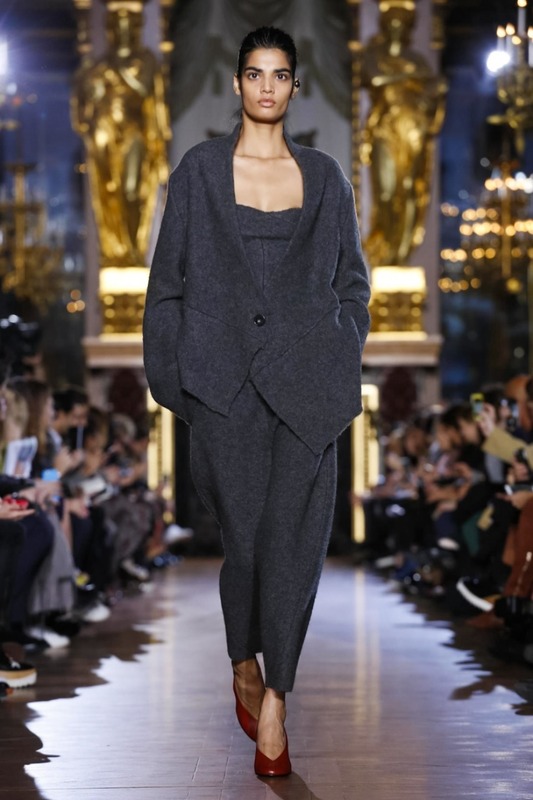 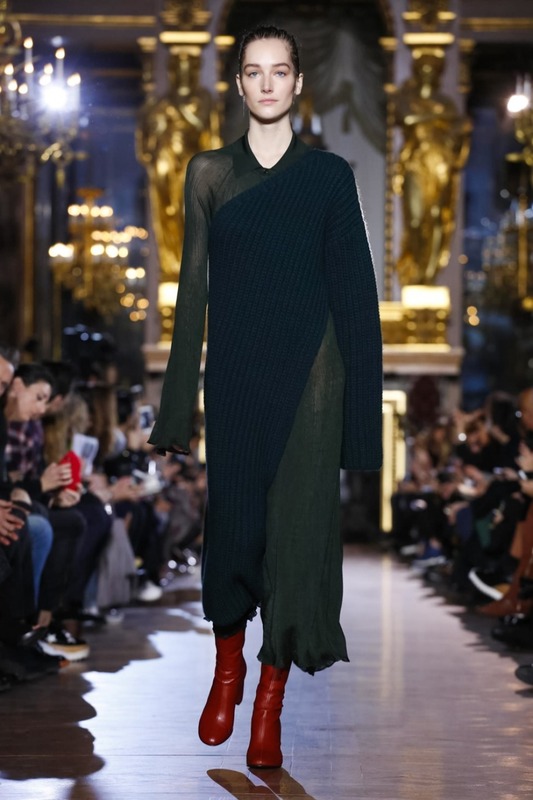 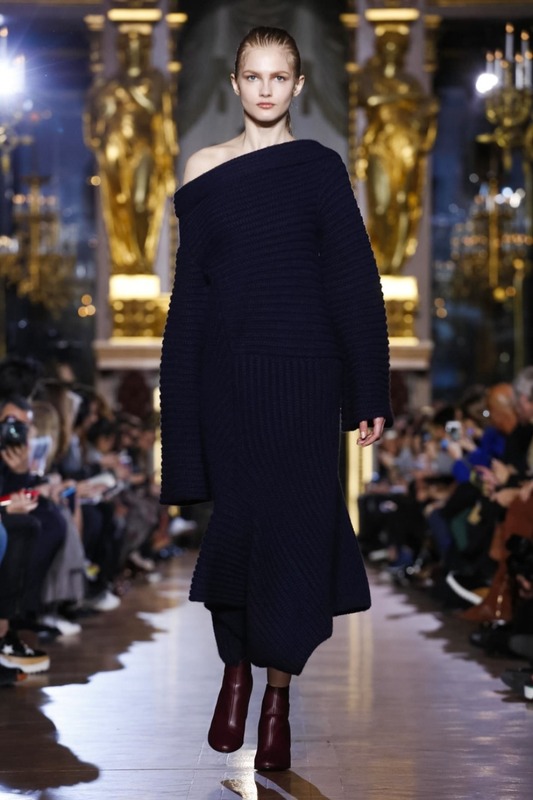 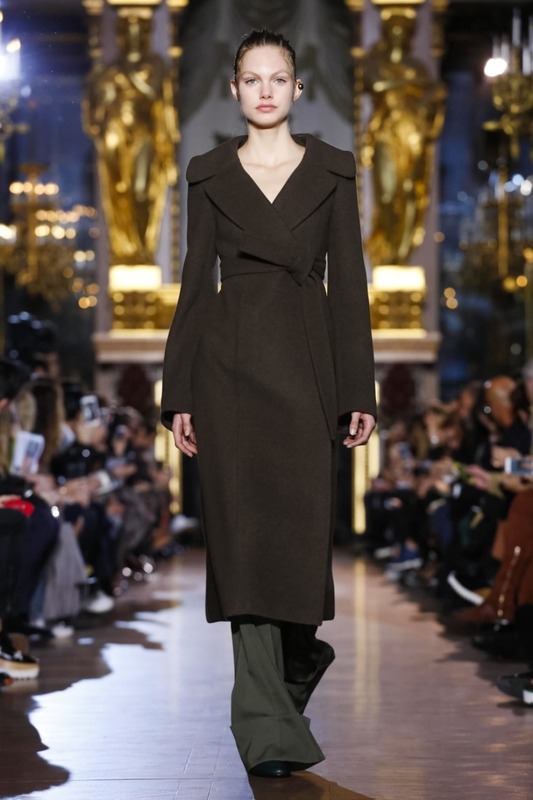 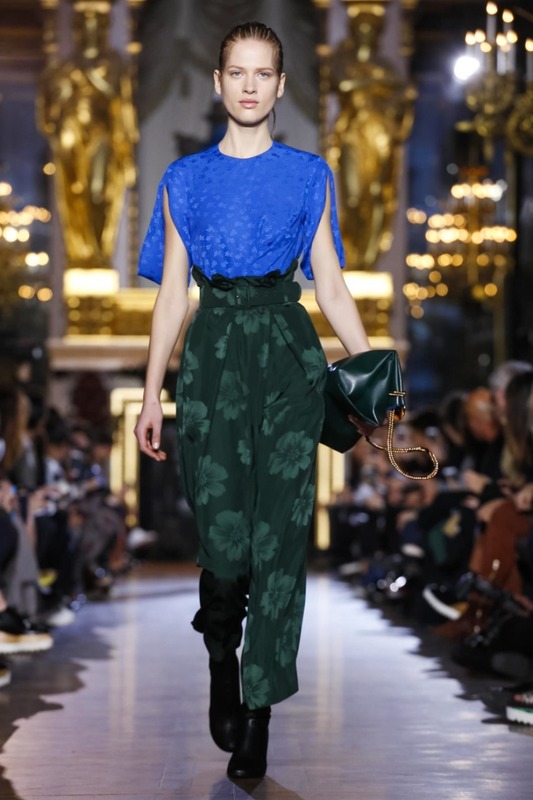 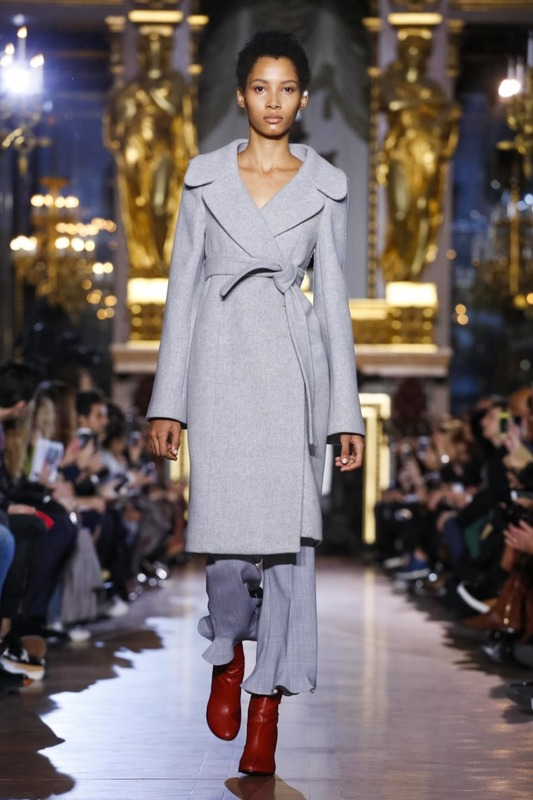 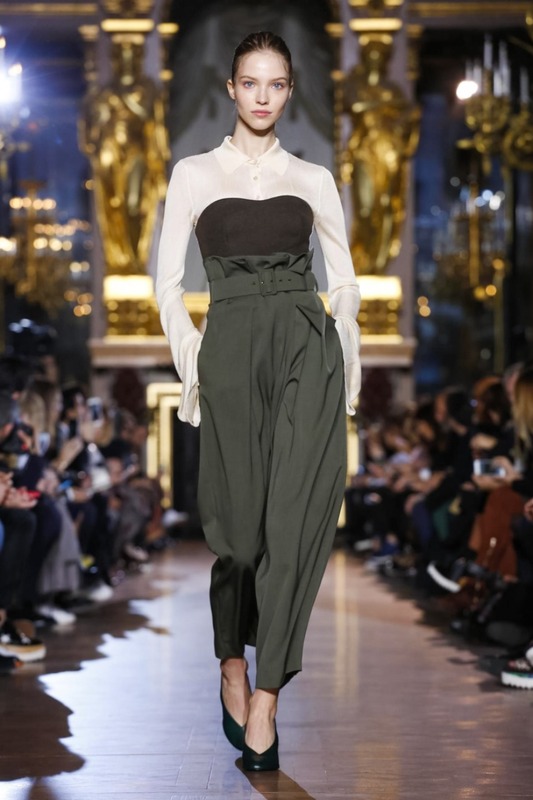 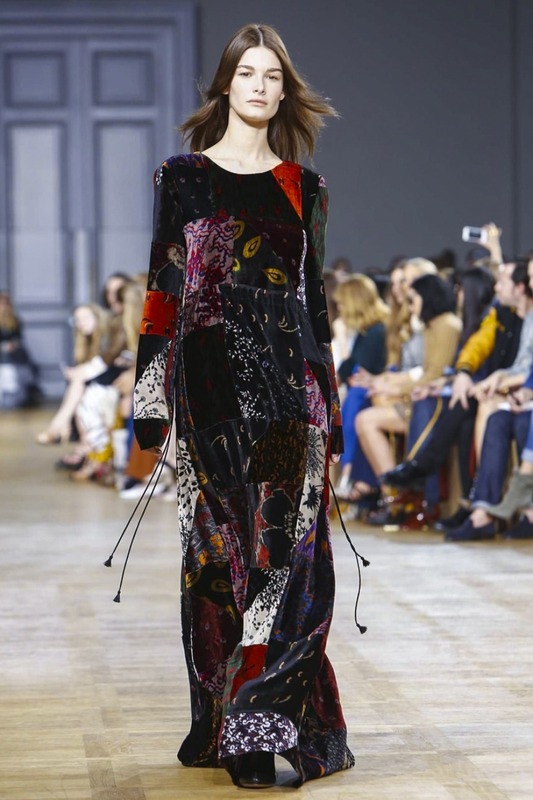 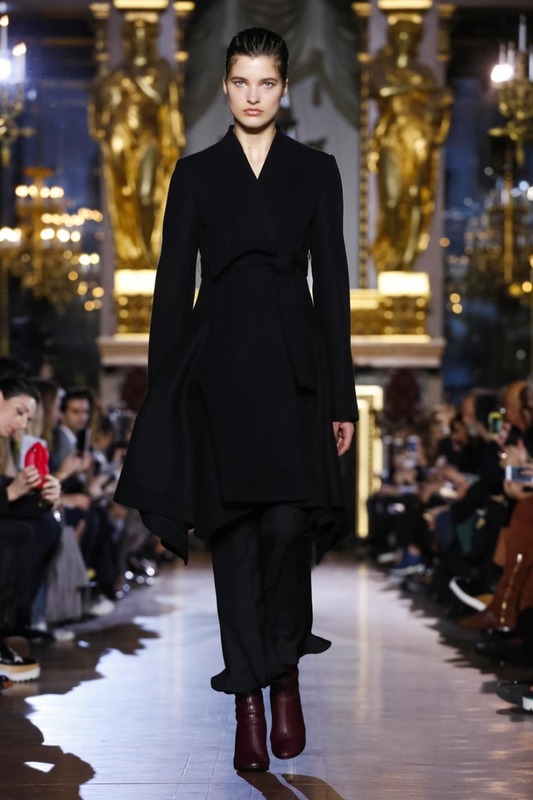 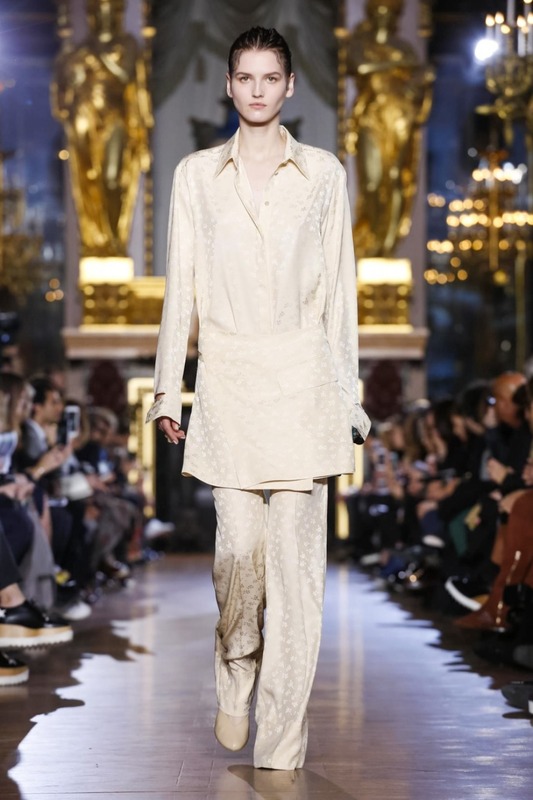 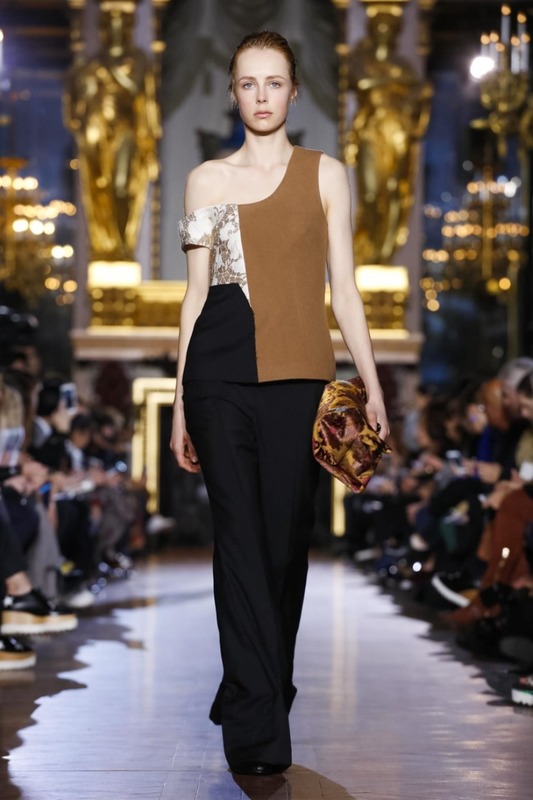 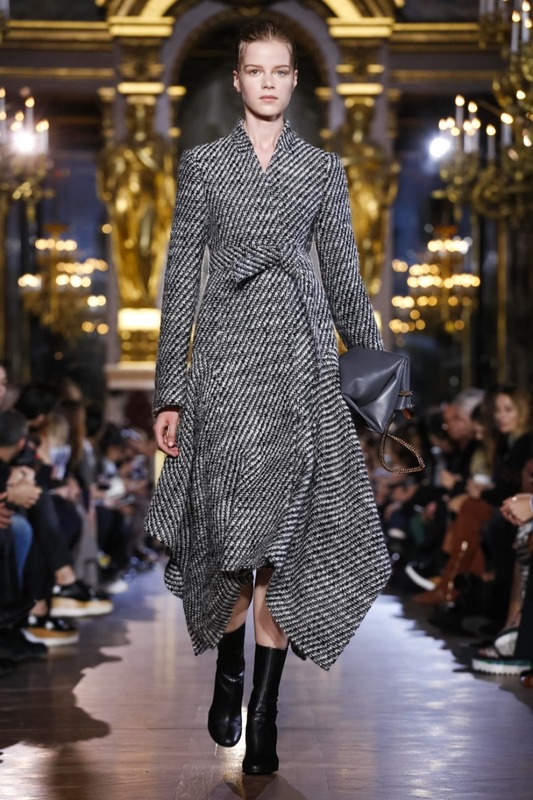 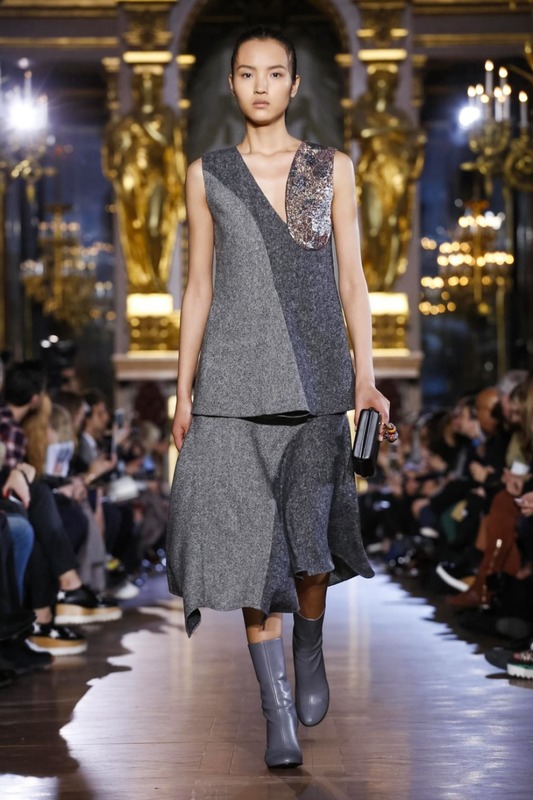 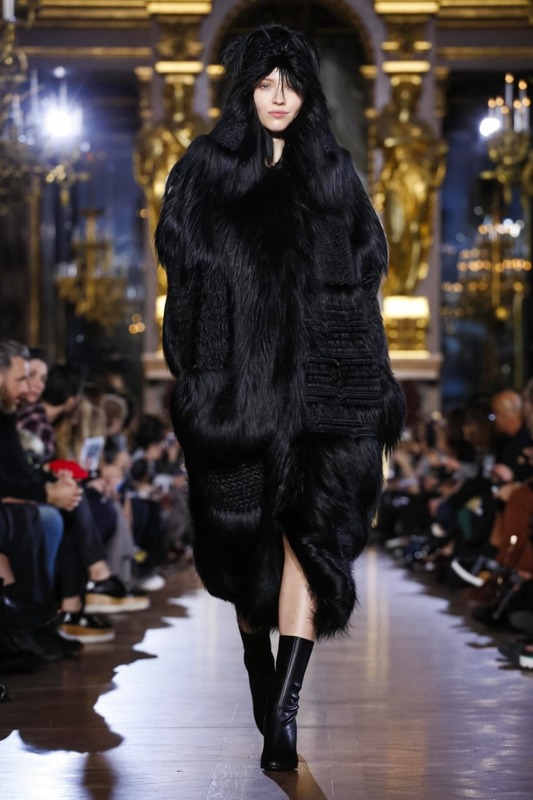 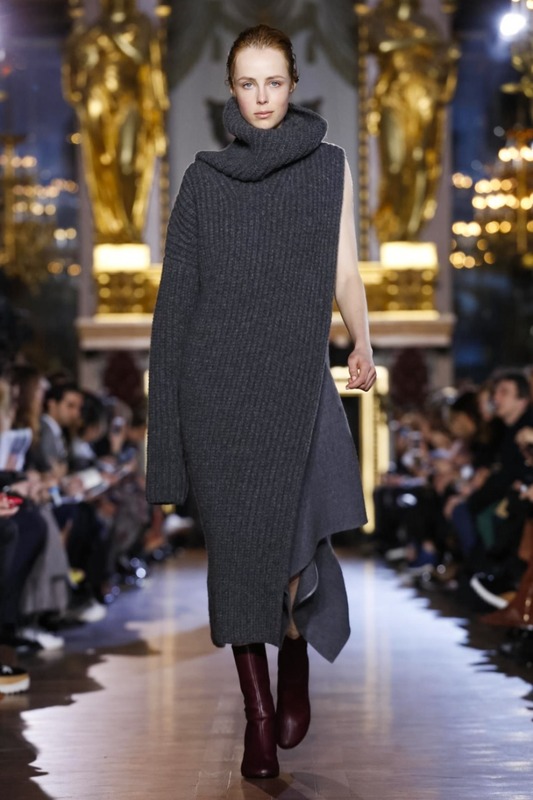 Re-Sees : Stella McCartney Fall/Winter 2015-2016 collection – Feminine elegance on the runway! 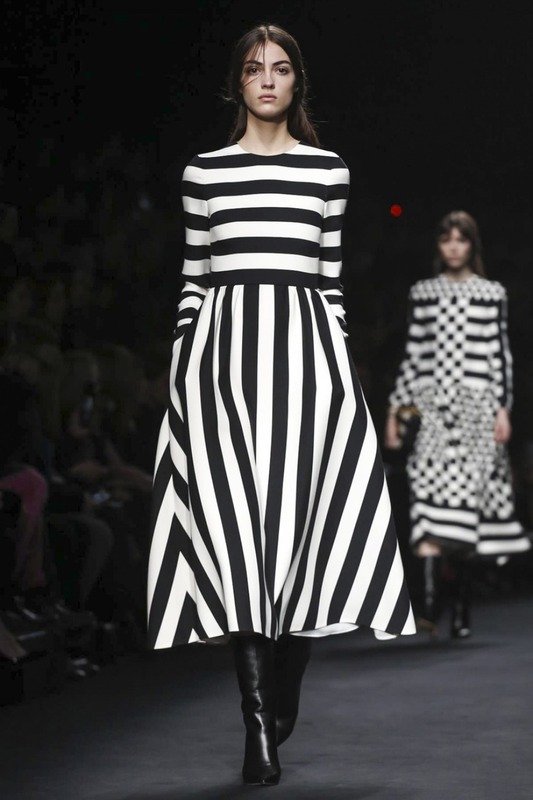 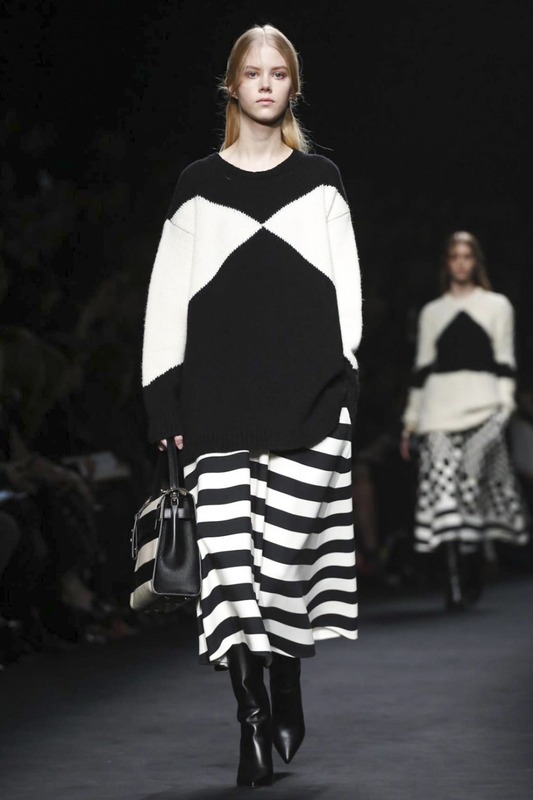 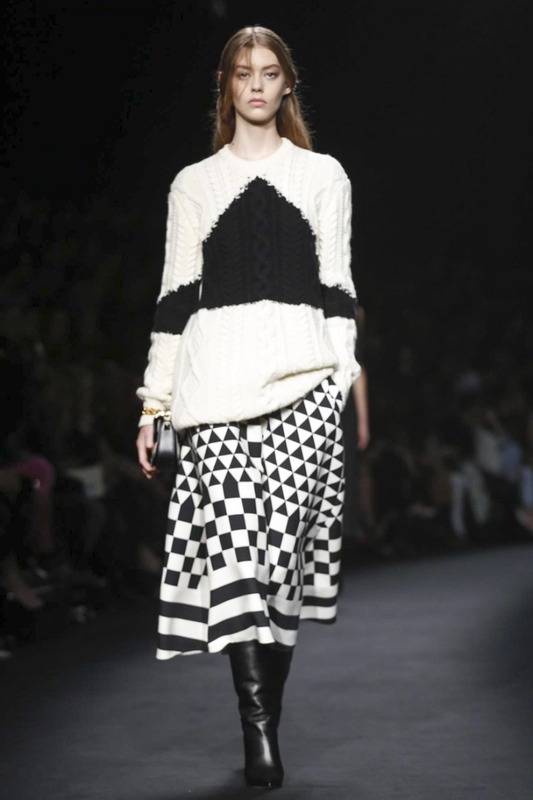 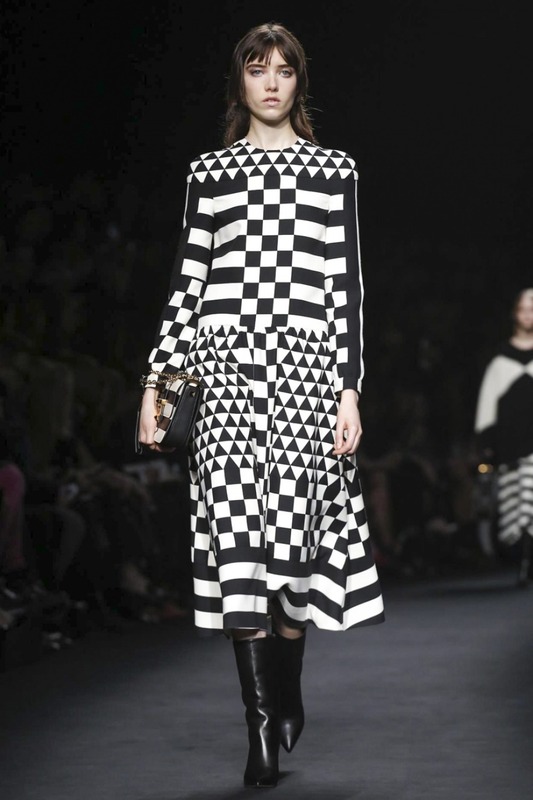 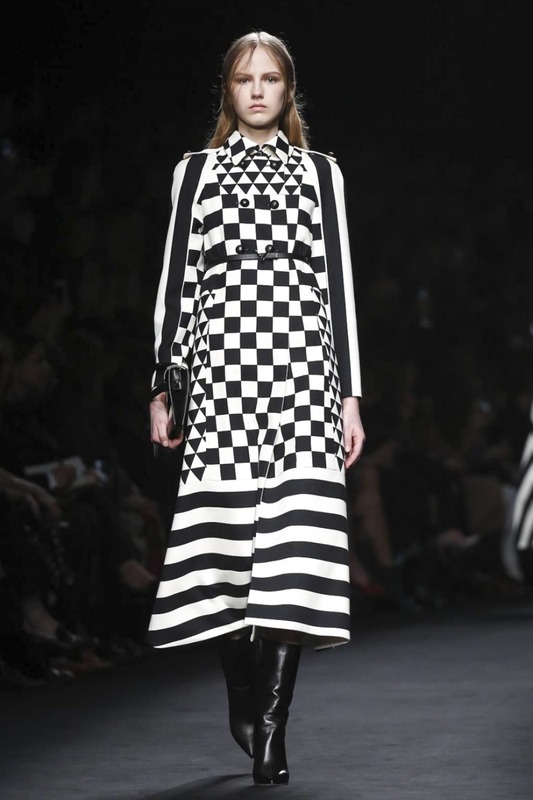 Eveningwear becomes graphic and returns to black and white. 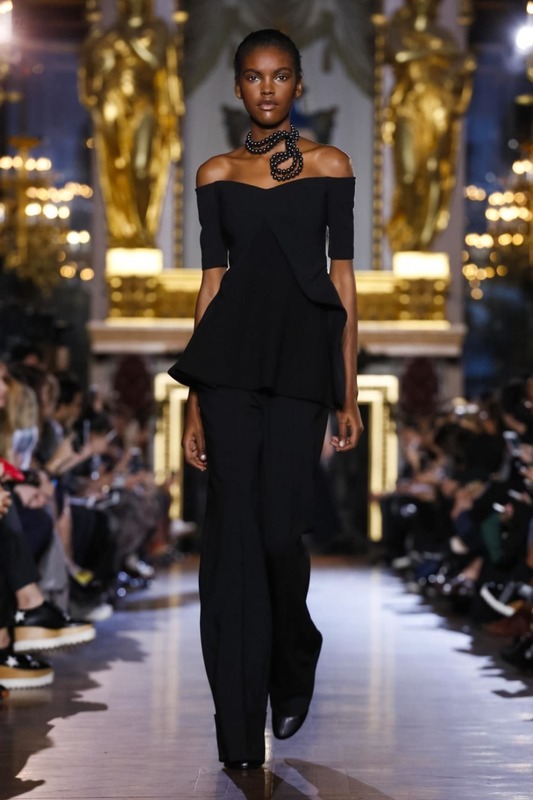 Most of evening Outfits are also with „off“ the shoulder , pearl necklaces and ear jewellery makes the runway looks perfect. 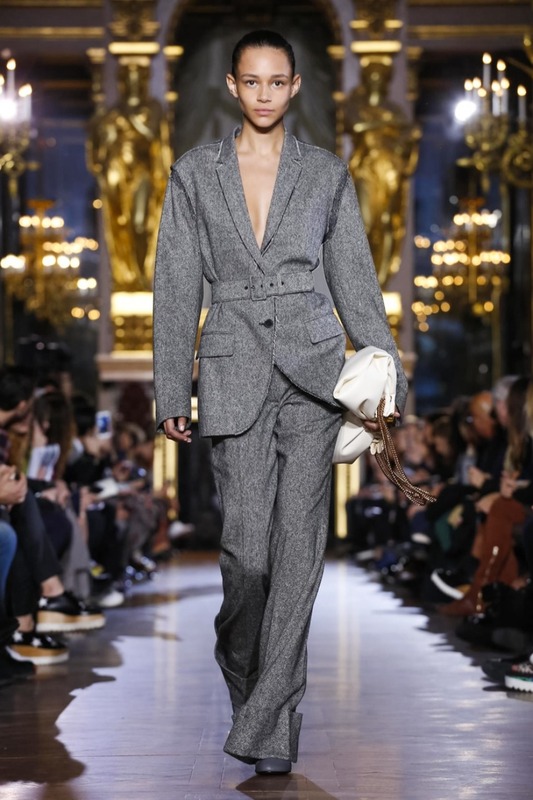 I think that a lot of woman will wear Stella McCartney in this season,.The silhouettes are easy to wear, the colours can seems for somebody a Little bit boring but for daily life ,for office and also for evening – The Daily Life is matching with the Commands of Fashion!